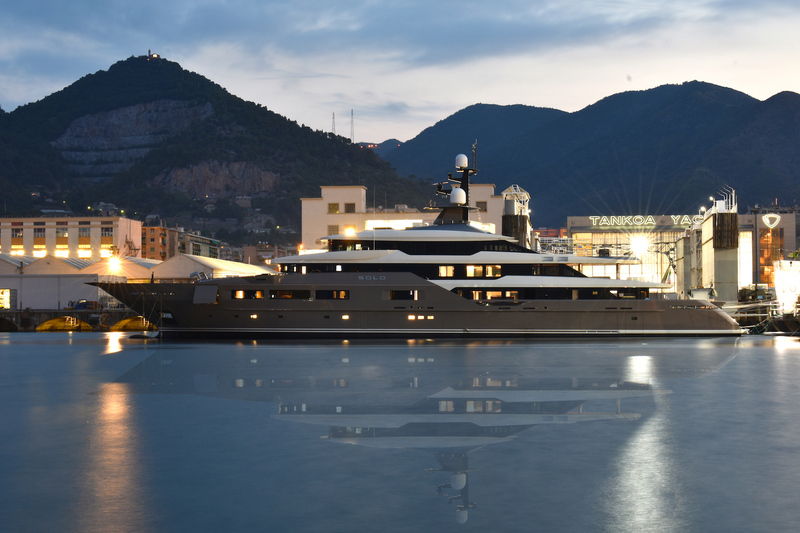 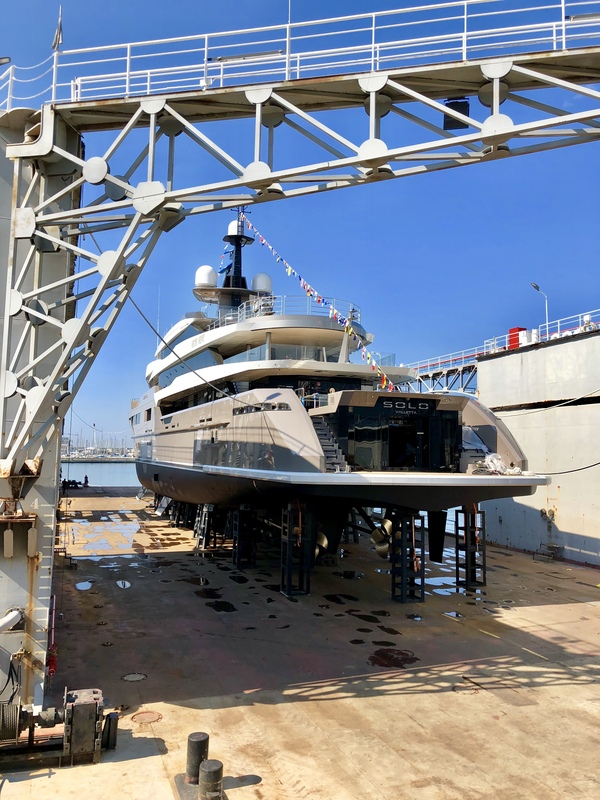 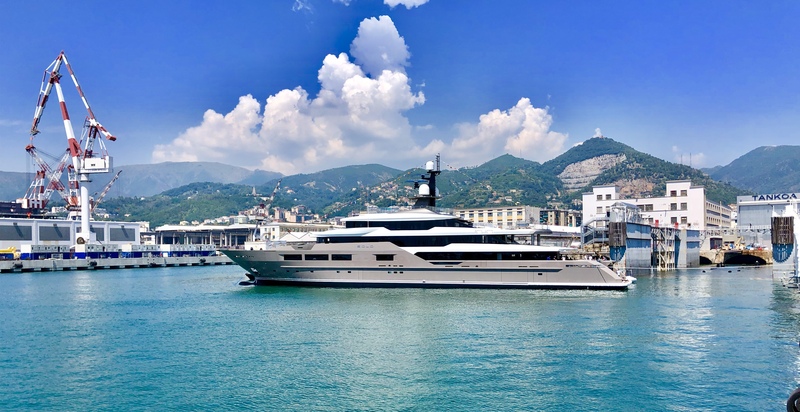 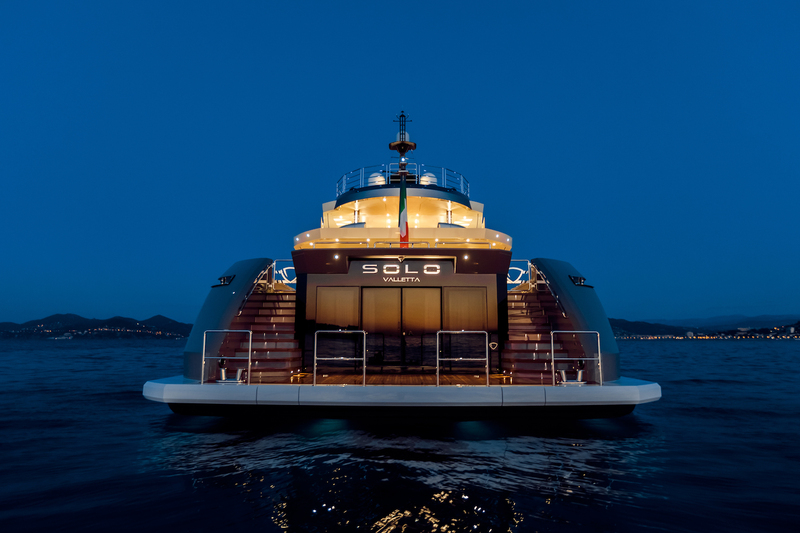 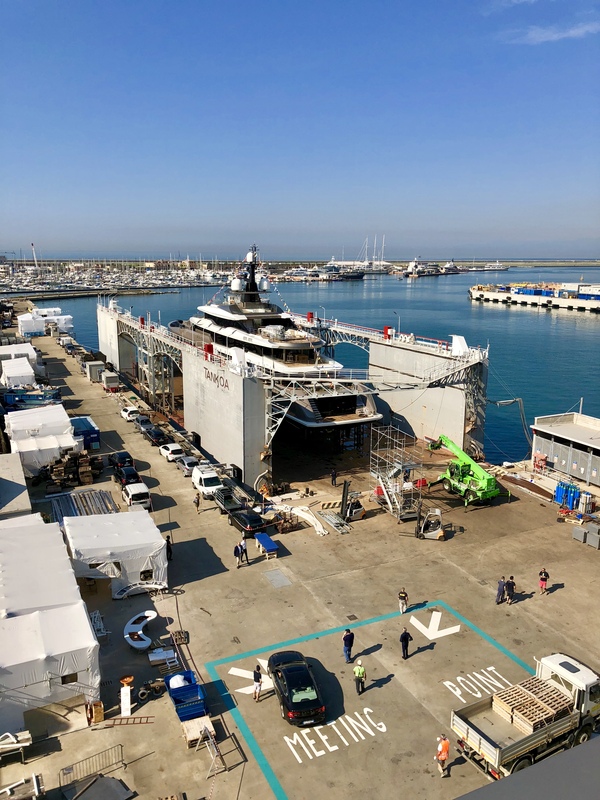 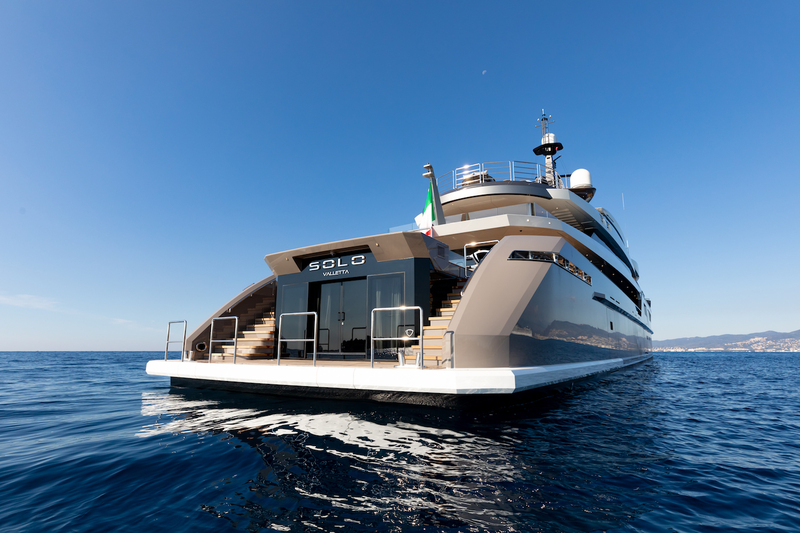 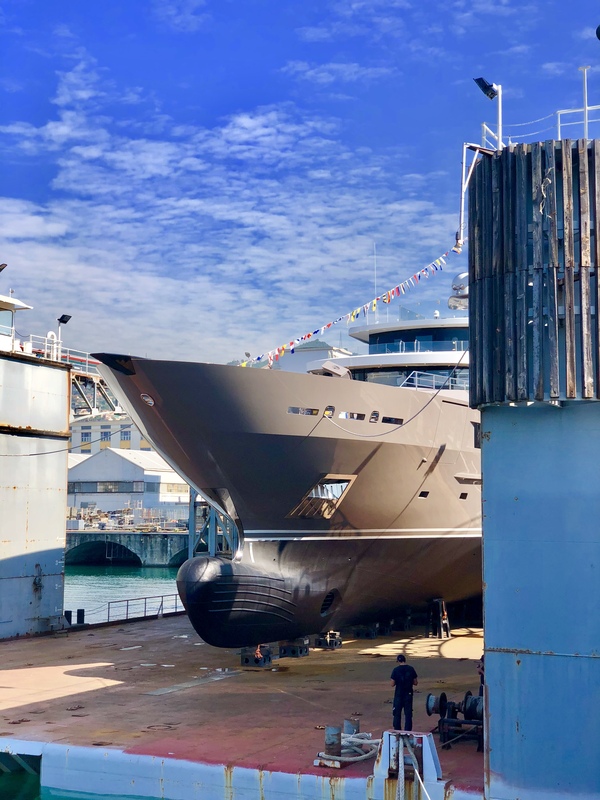 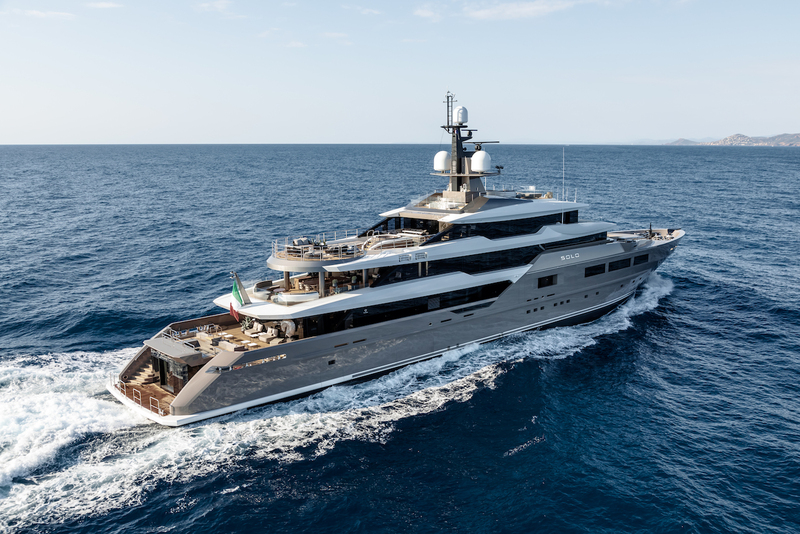 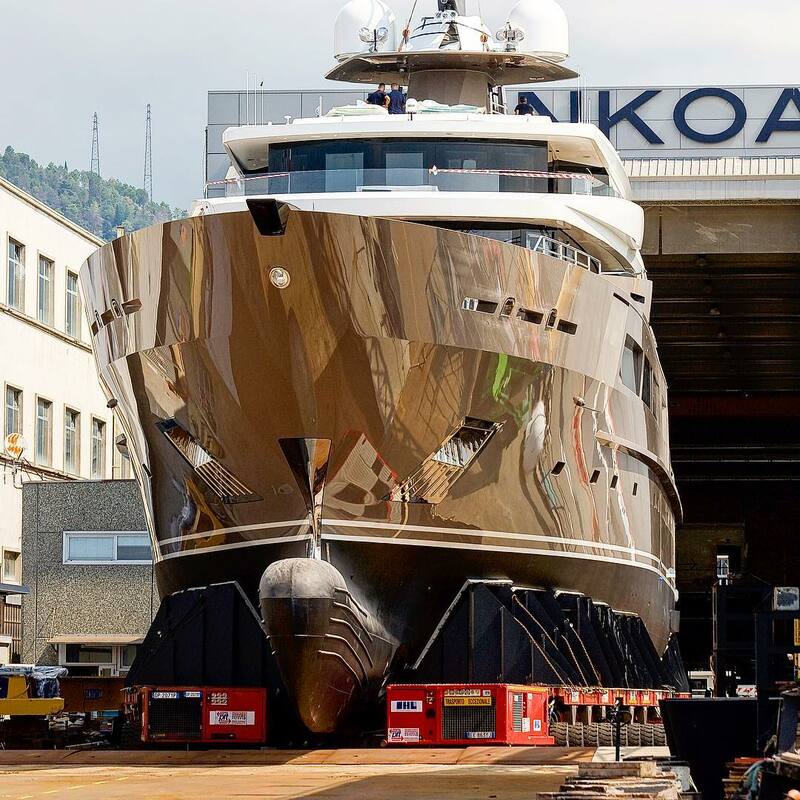 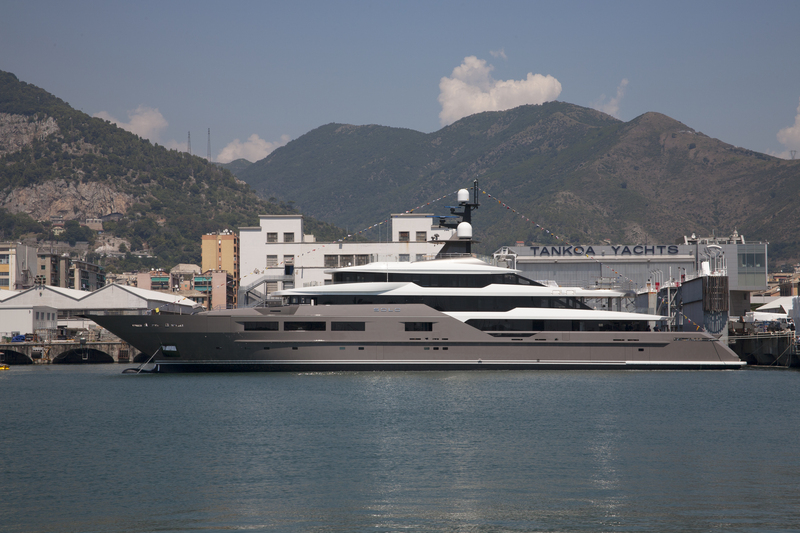 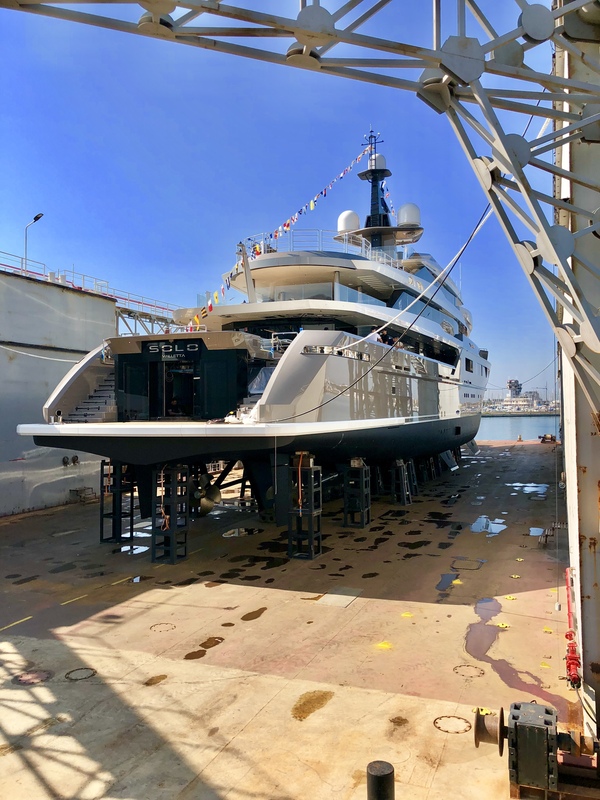 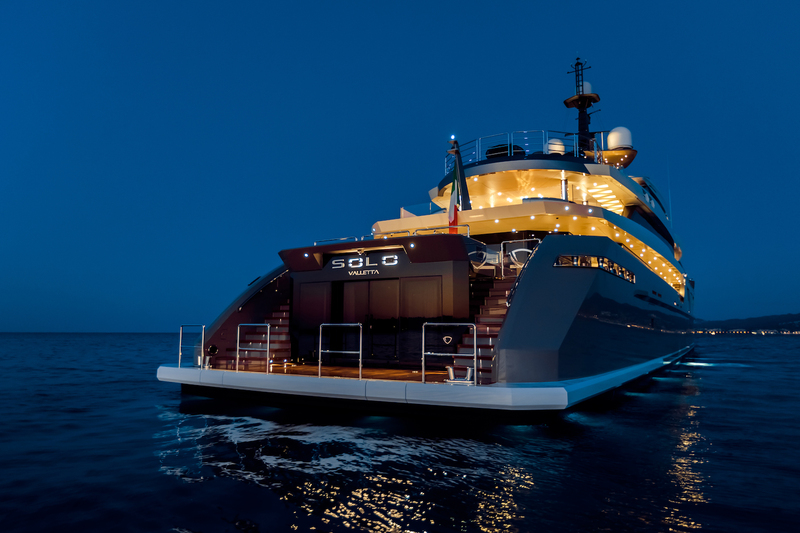 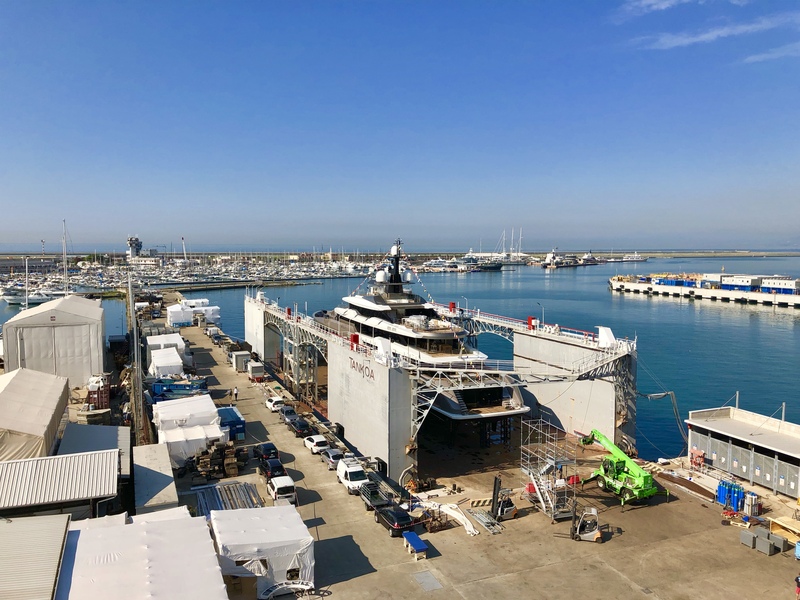 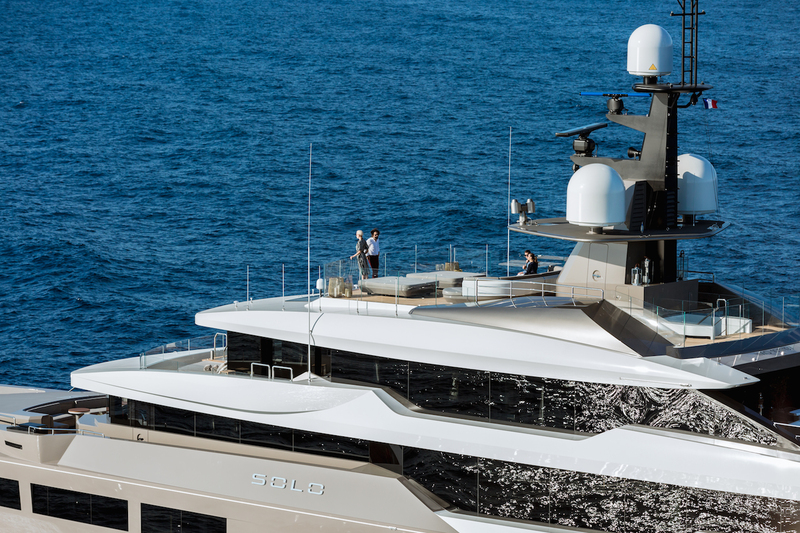 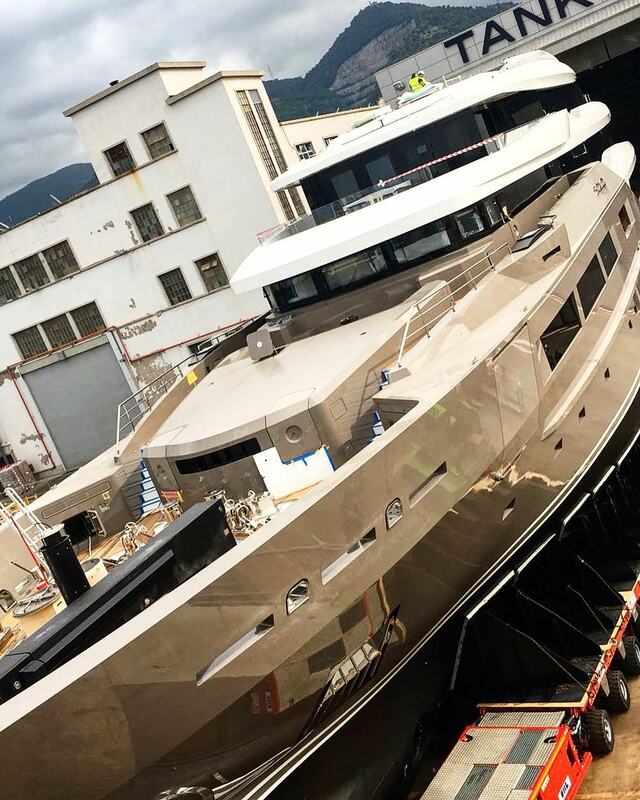 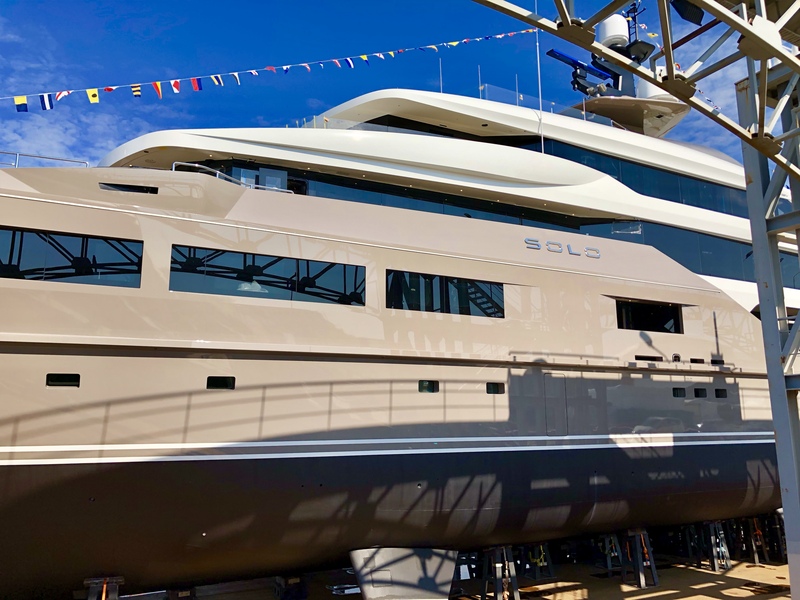 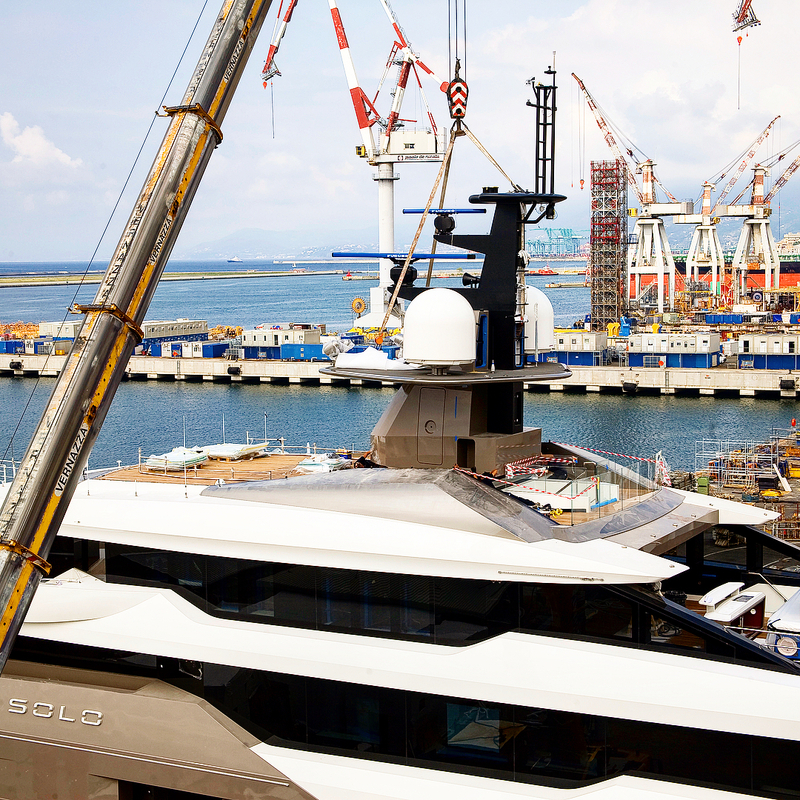 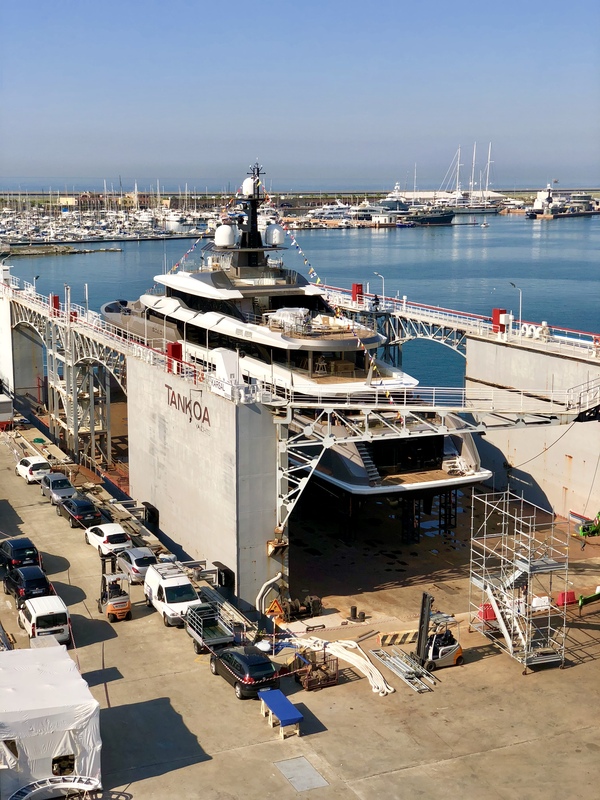 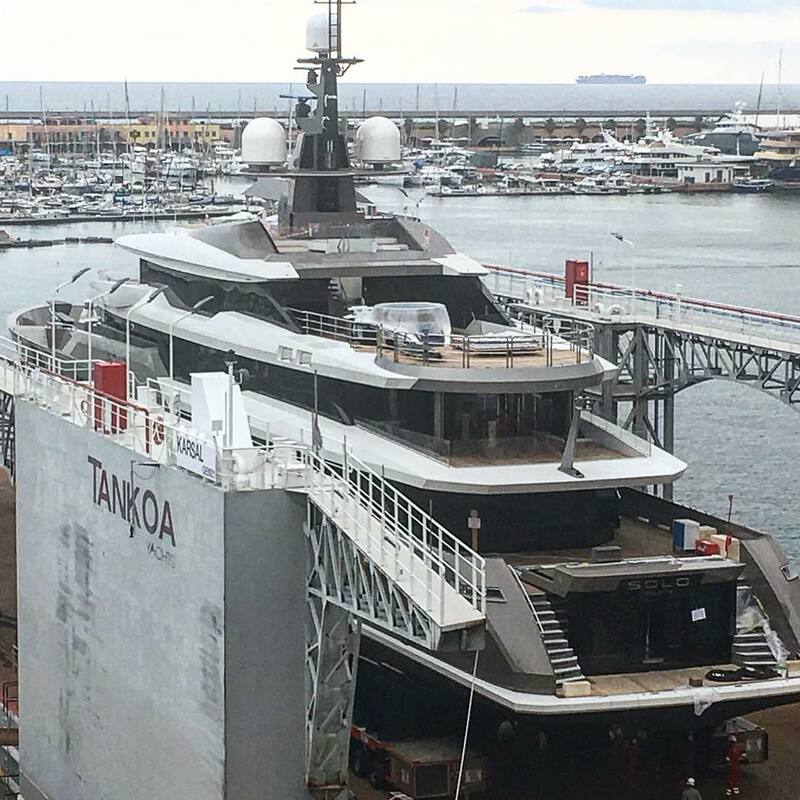 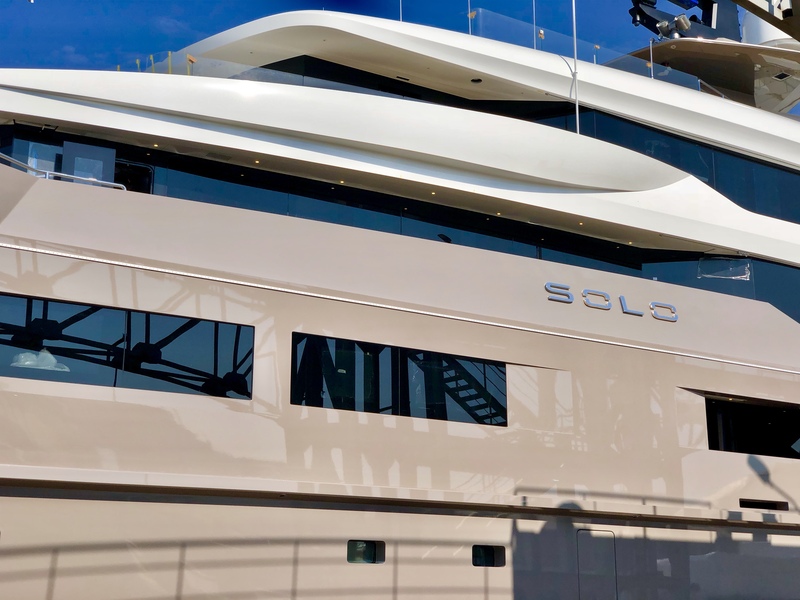 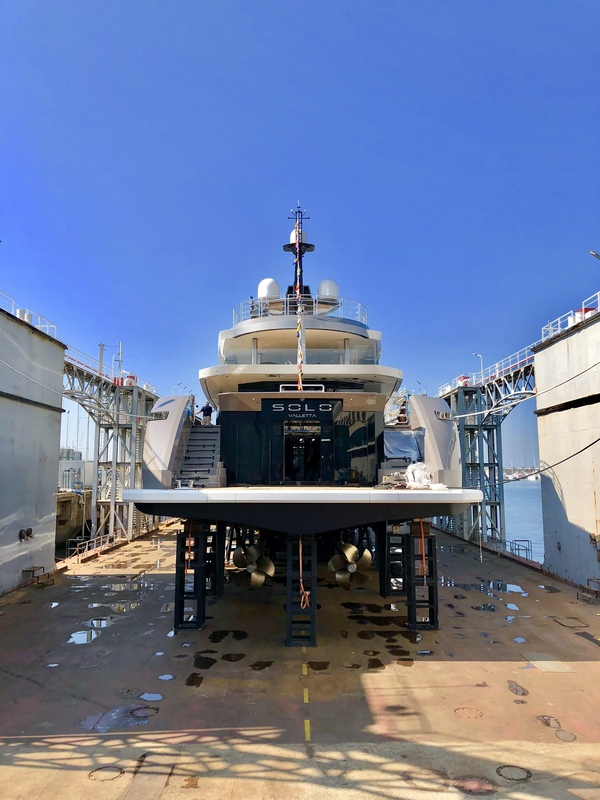 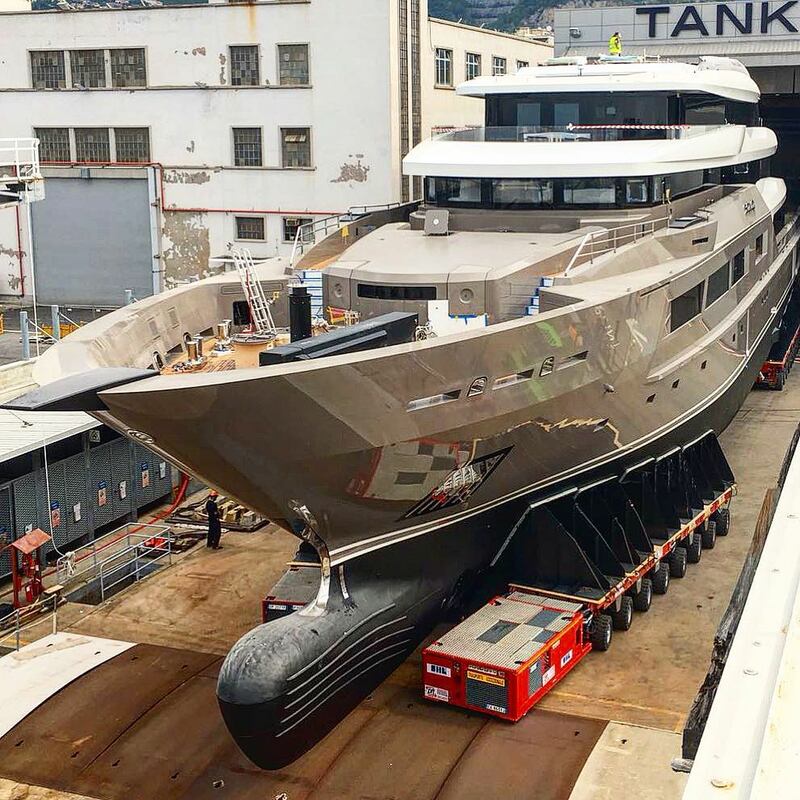 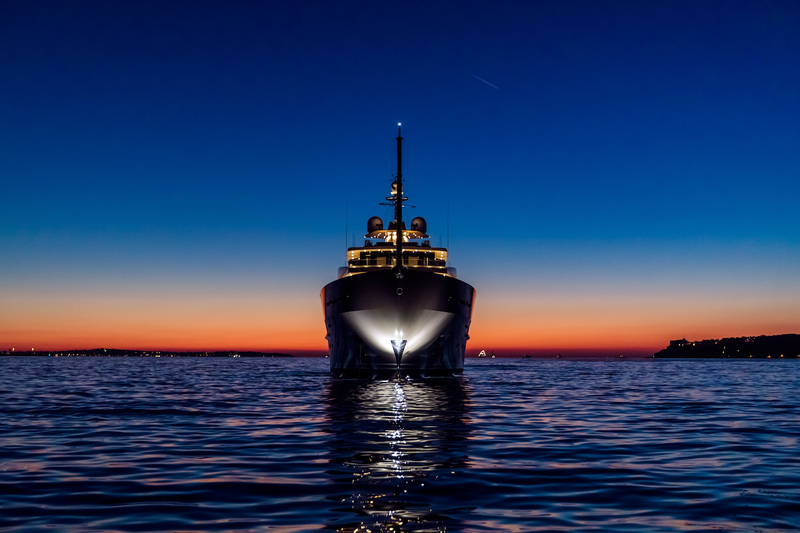 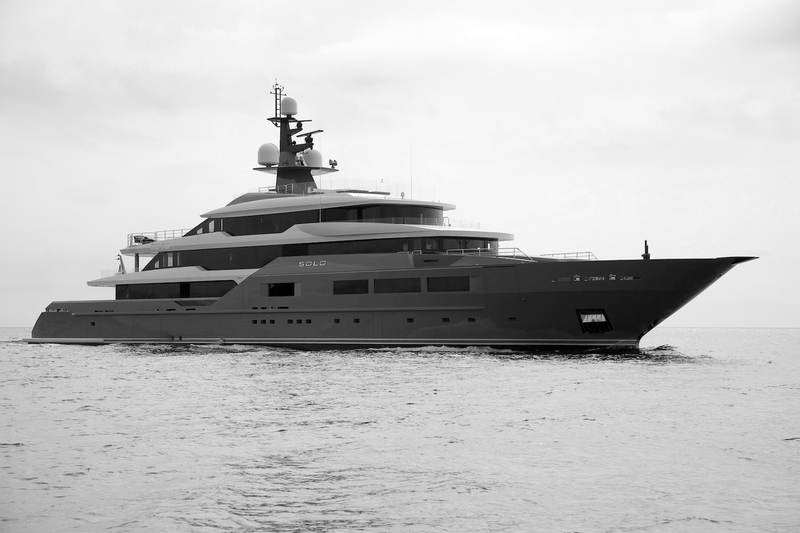 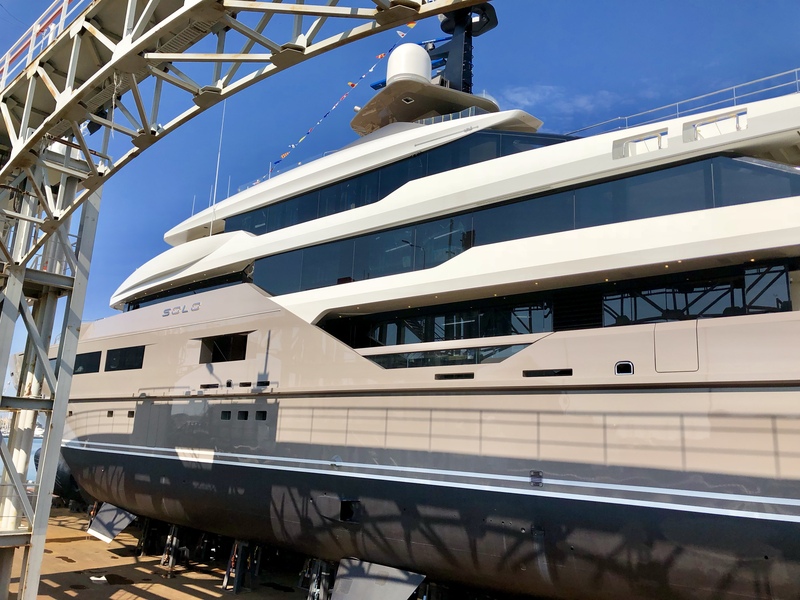 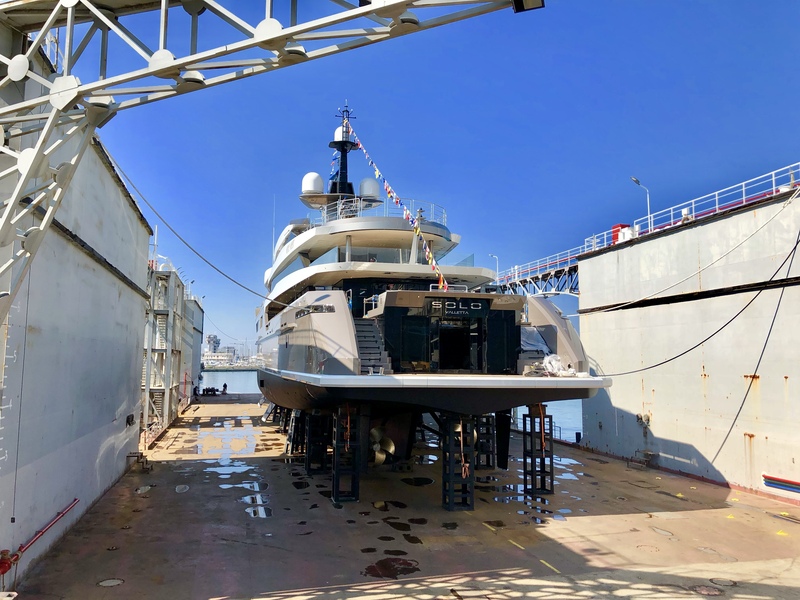 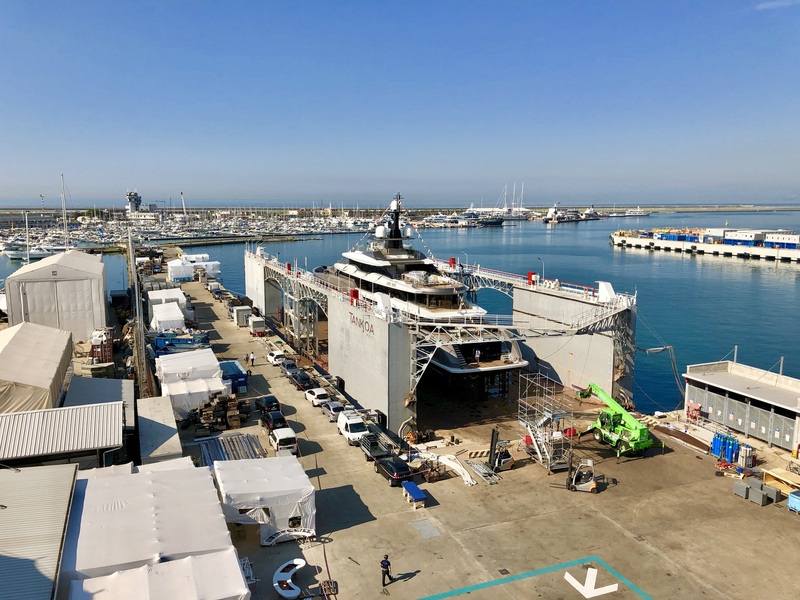 Built by Tankoa and launched in 2018, superyacht SOLO (ex.TANKOA S701) is a 71m/233ft vessel featuring the naval architecture of Studio Ruggiero in conjunction with Tankoa Yachts. 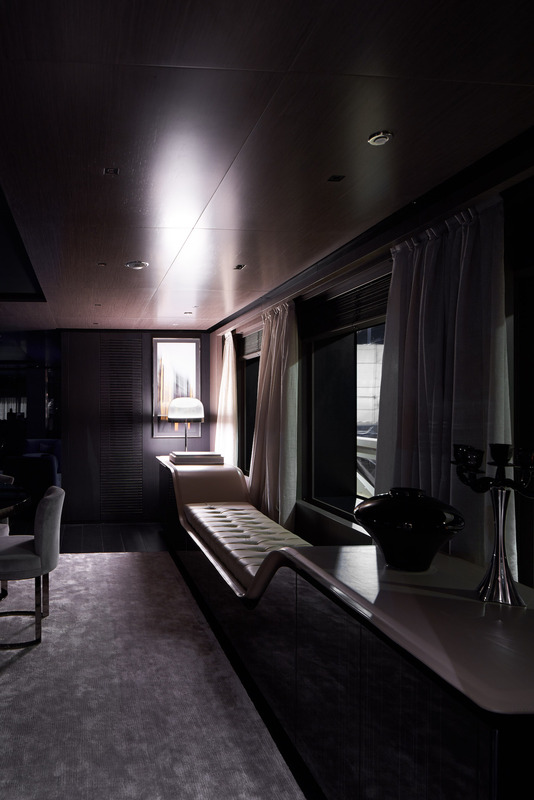 The exteriors were designed by Francesco Paszkowski, who also worked with Margherita Casprini to complete the interiors. 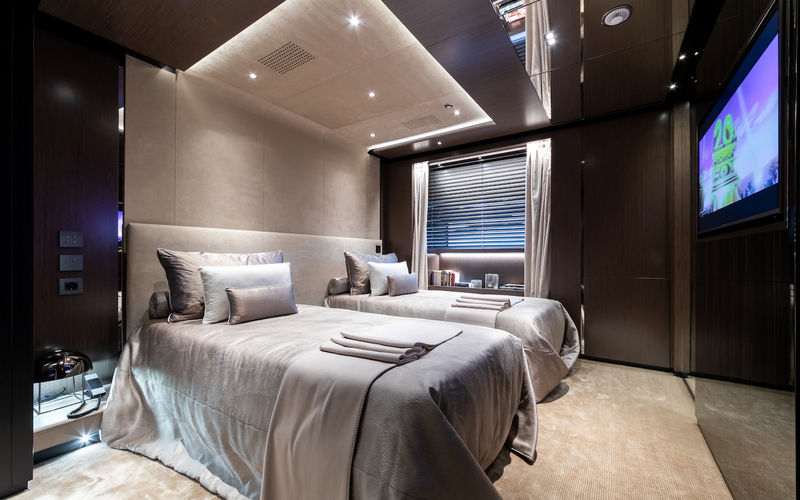 The guest accommodation consists of 6 en-suite cabins: 1 Master suite, 1 VIP stateroom, 2 double cabins and 2 twin cabins. 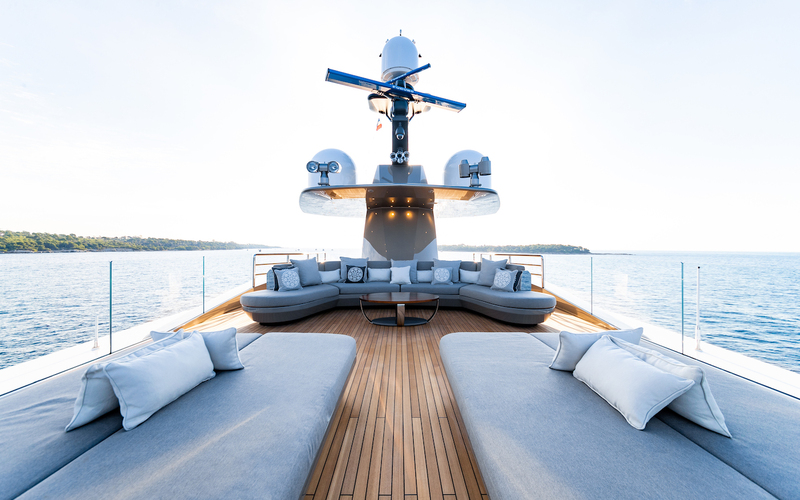 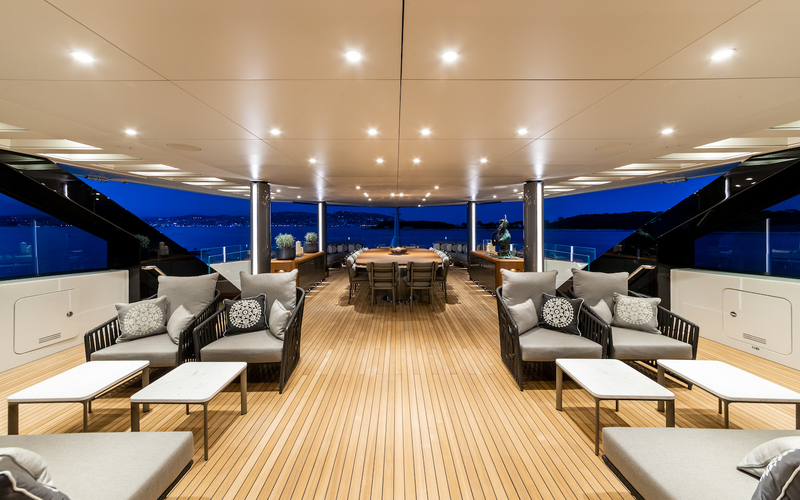 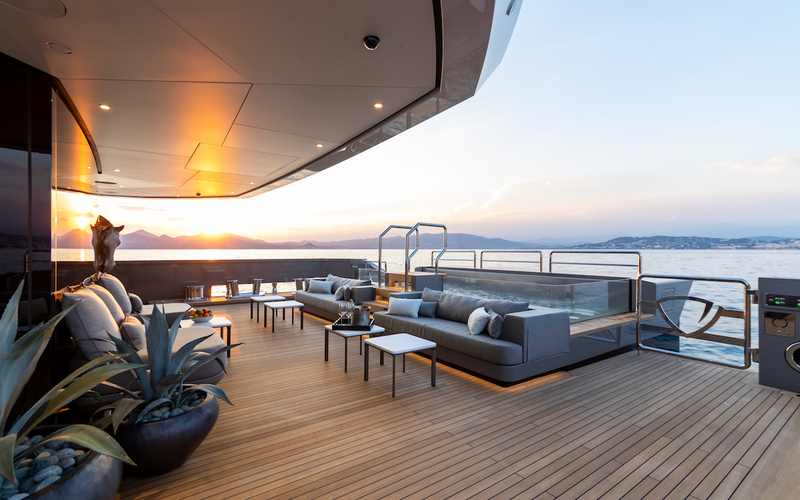 The aft main salon blends interior and exterior living areas with a Winter garden for all-weather use while offering a greater connection with the ambient surroundings. 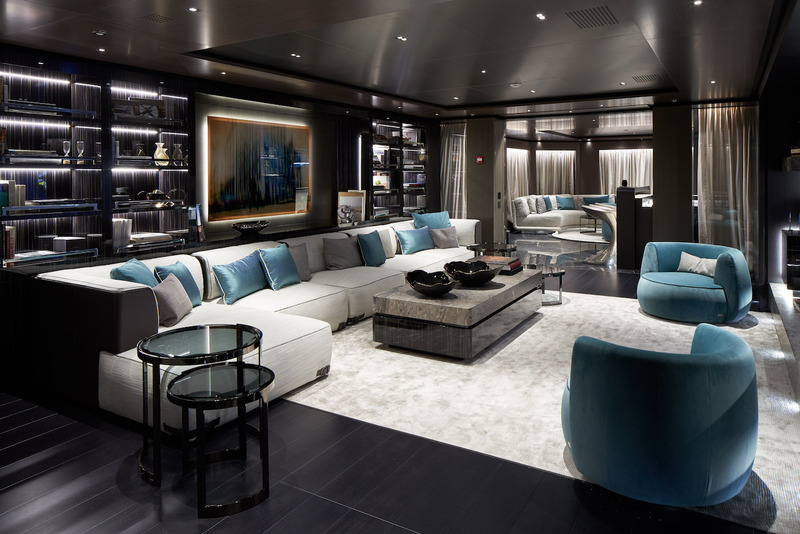 Within this space, there is a sofa with chaise-lounge and armchairs around a coffee table as well as a bar. 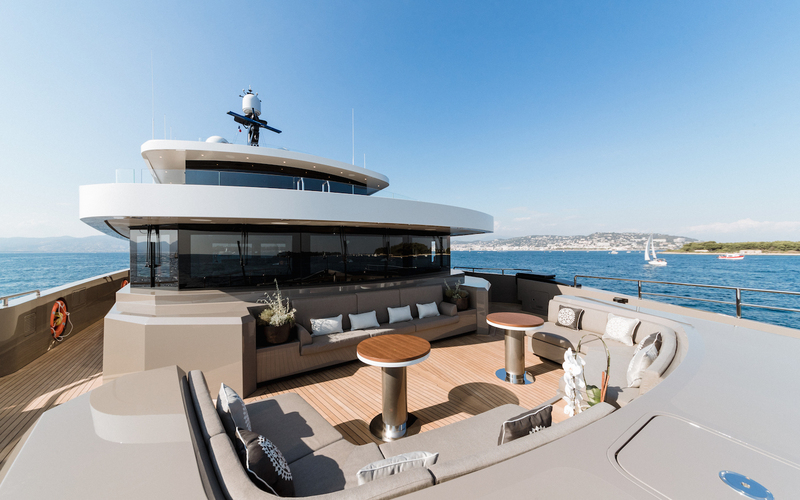 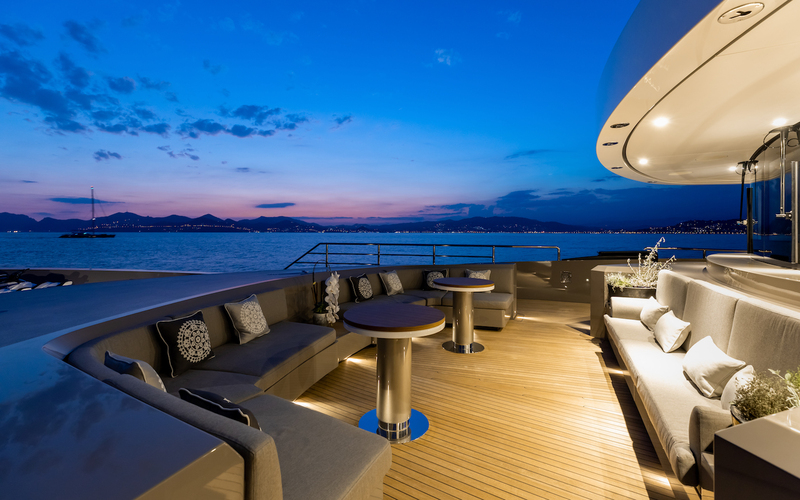 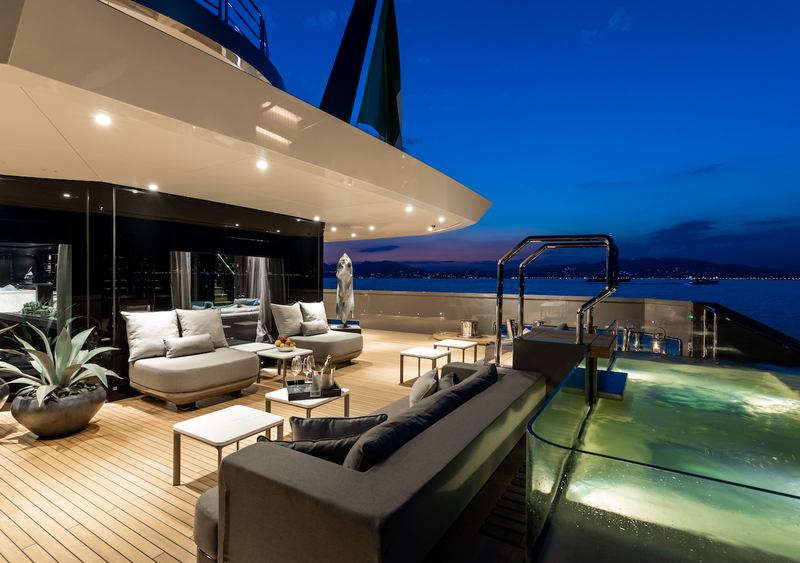 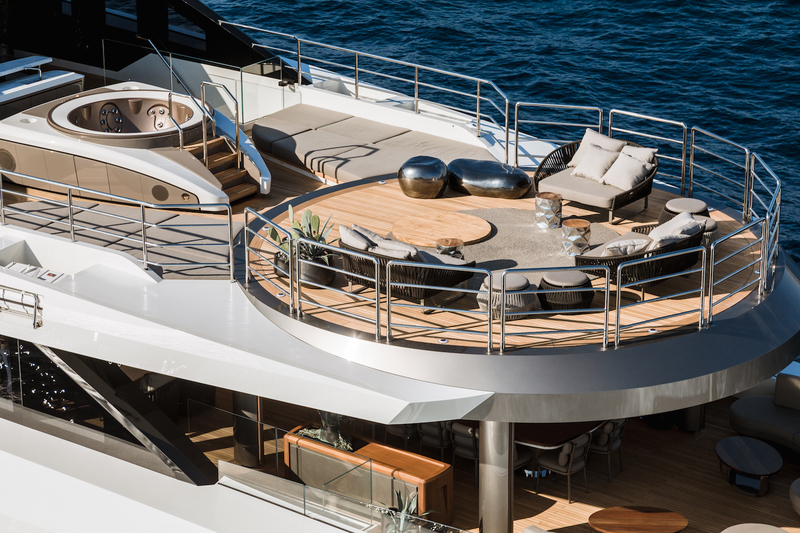 Another alfresco lounge is placed near the stern and provides one long sofa and a pair of sofas opposite that are separated by two coffee tables between the gap. 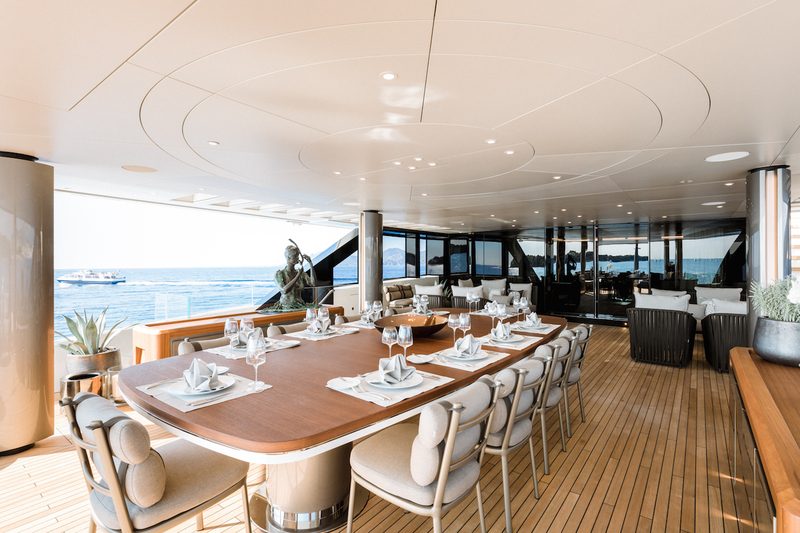 For guests looking to dine alfresco in style, the partially-shaded upper deck has a grand table able to seat up to 14 guests. 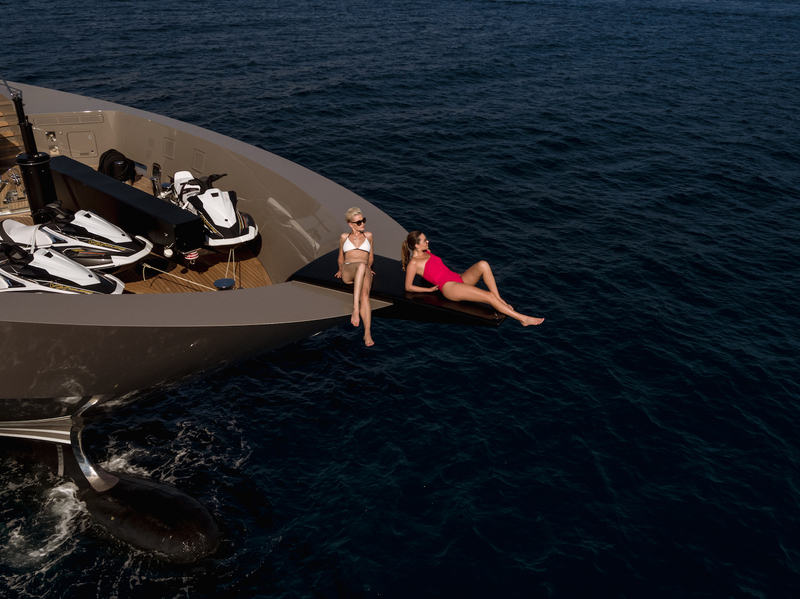 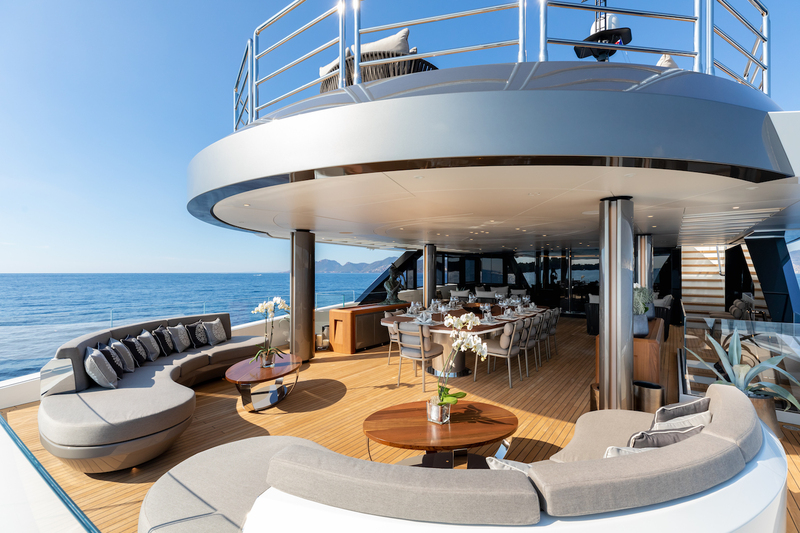 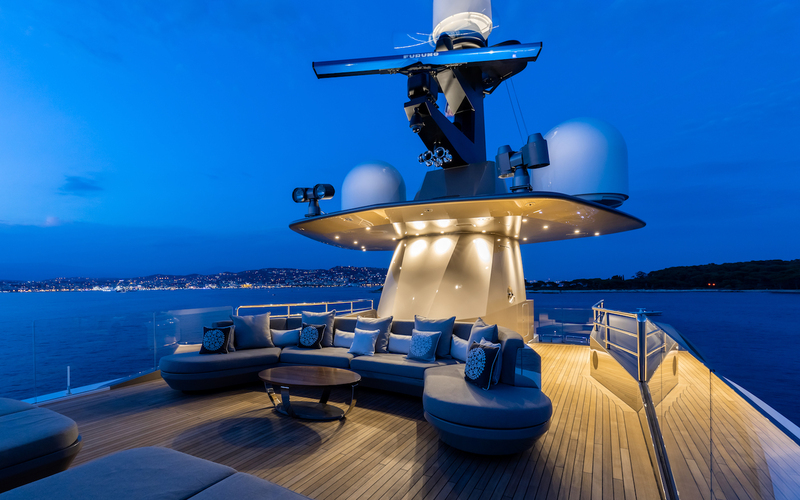 After a sumptuous meal, there are two double-sized sun pads in the shade and an oversized sun pad integrated into the starboard-side of the stern, with a plush lounge opposite where guests can unwind with drinks and watch the sunset. 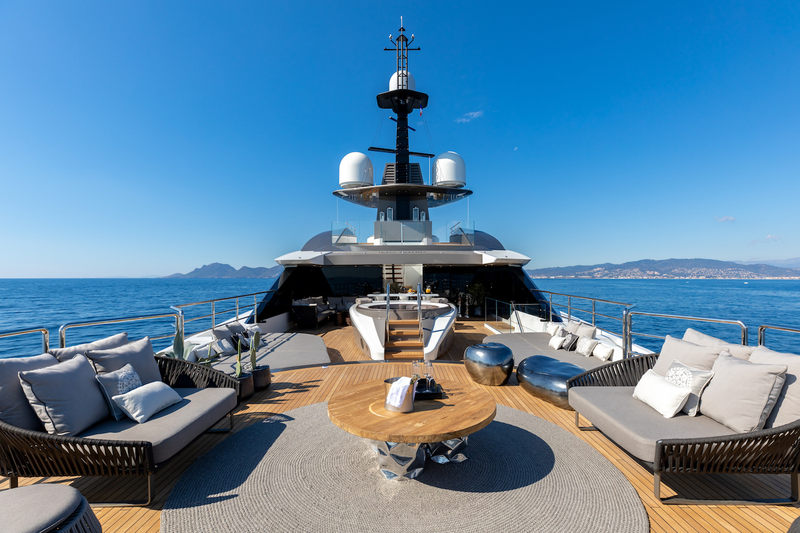 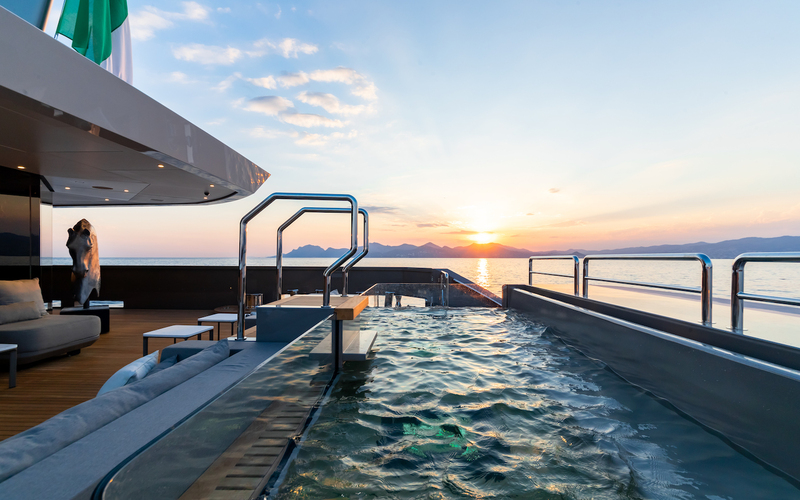 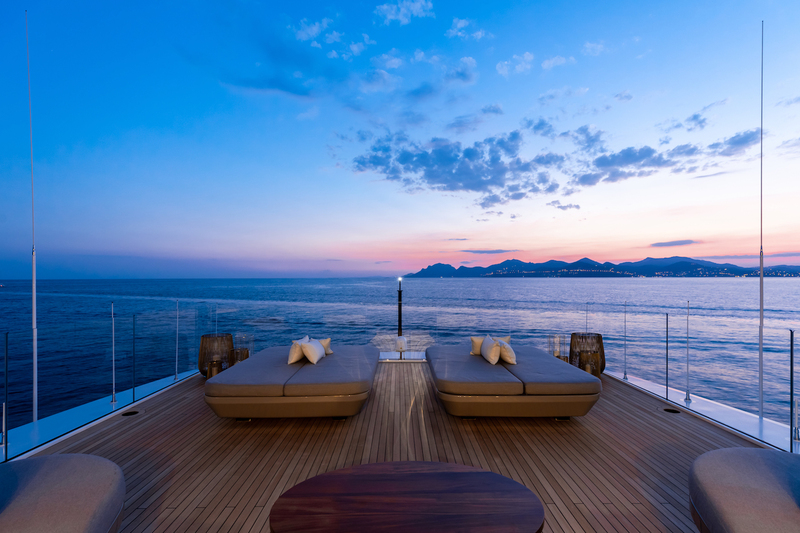 The bridge deck aft is an ideal relaxation space and comes fitted with a large raised Jacuzzi in the shade and two large sun pads, plus a bar. 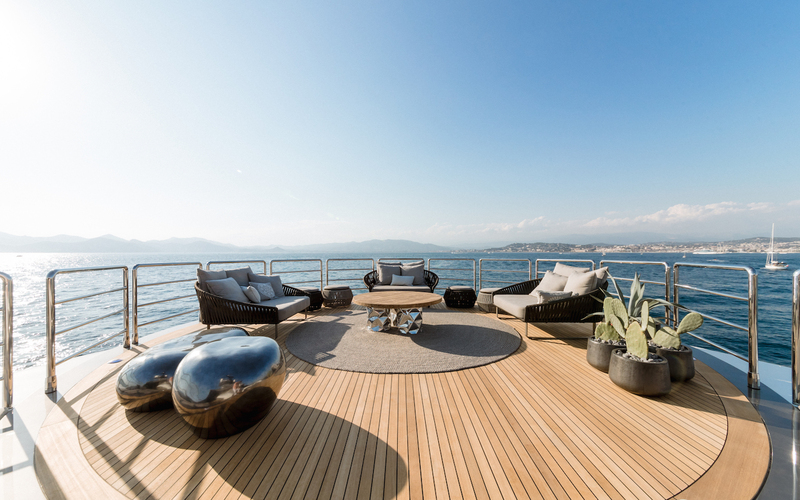 The touch-n-go helipad can be used as an additional sunbathing area for sun loungers. 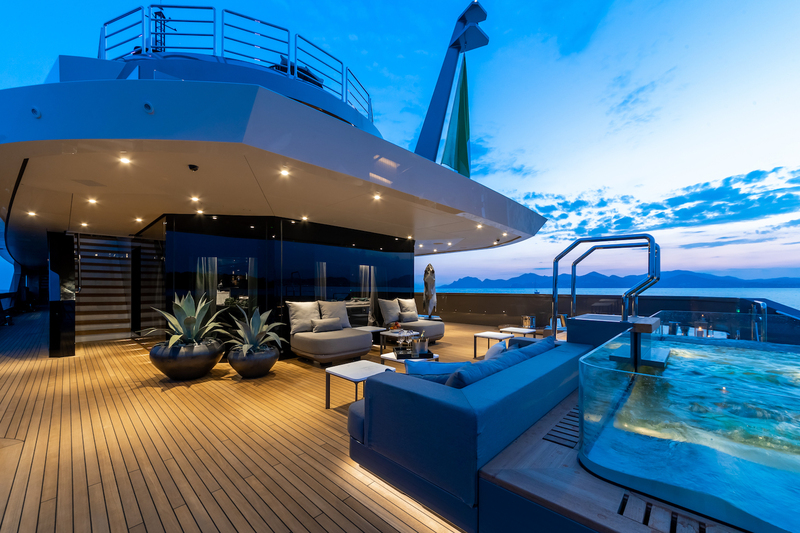 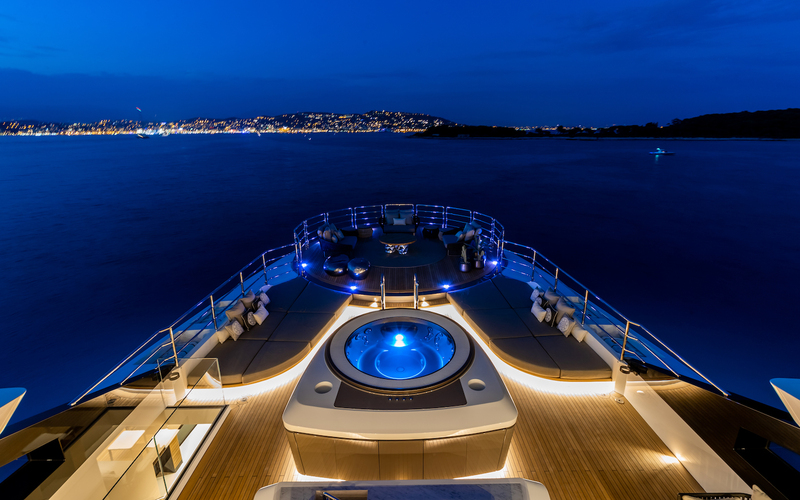 The upper deck belongs to the Master suite and is laid out with sun pads, seating and a Bisazza mosaic tiled glass-walled Jacuzzi. 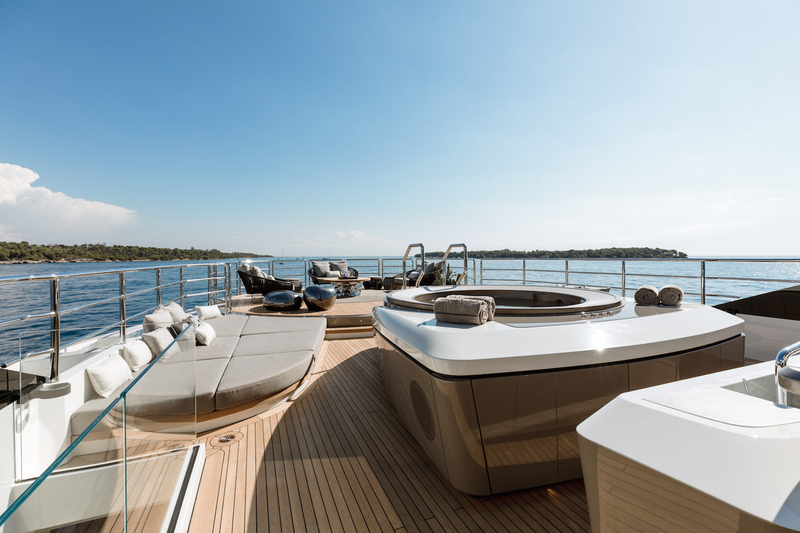 Above, the sundeck forward has a generous sun pad section as well as two L-shaped sofas to the aft which takes in uninterrupted views. 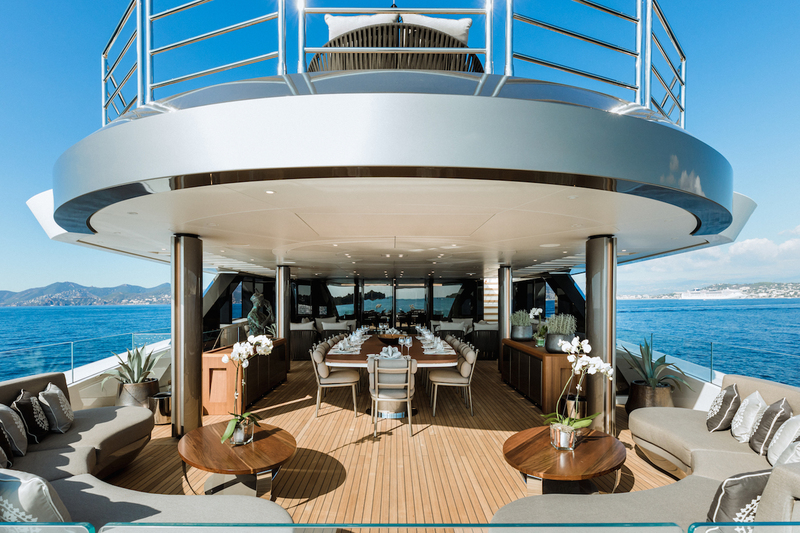 For guests arriving by tender, the beach club is likely to be the first guest space on board that they encounter. 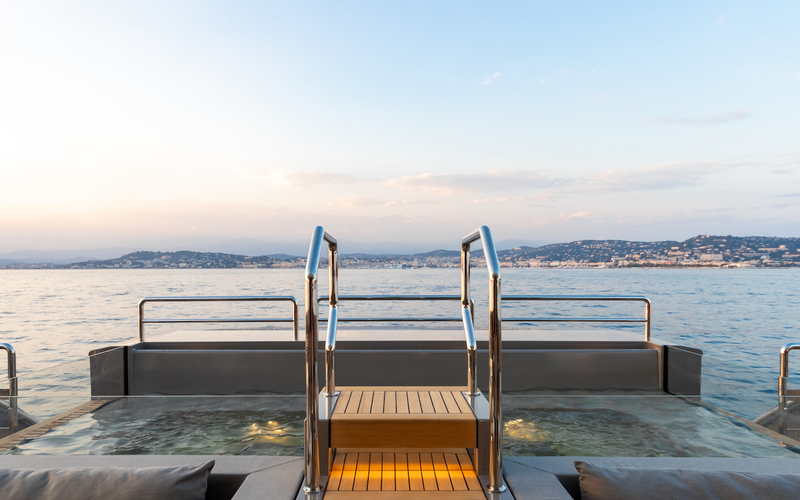 A large swim platform leads to a beach club with a bar and the salon is classically styled using a contemporary layout and materials to make the perfect environment for parties and celebrating special occasions. 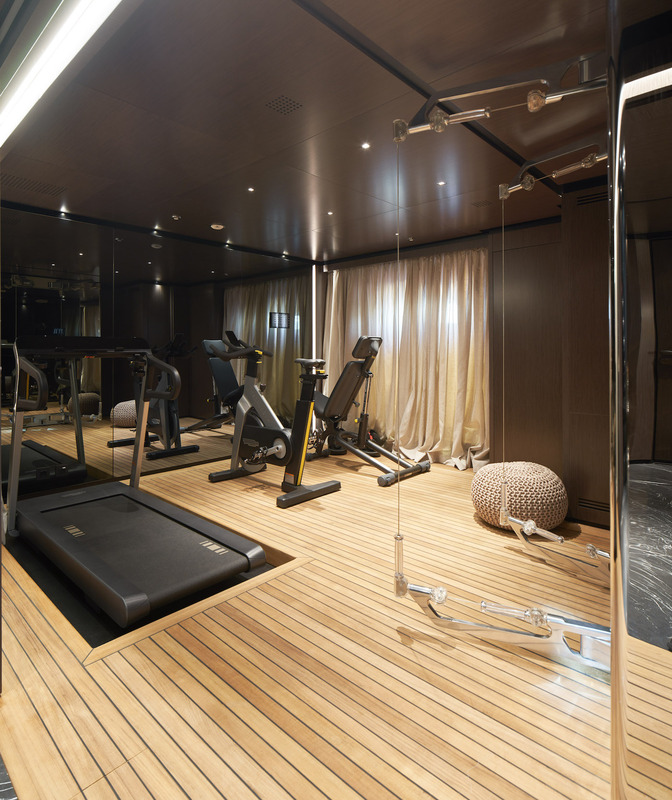 The beach club layout contains sofas, a bar, TV and an oversized glass-walled gym created by Technogym that benefits from a fold-out terrace for fresh air and cool sea breezes. 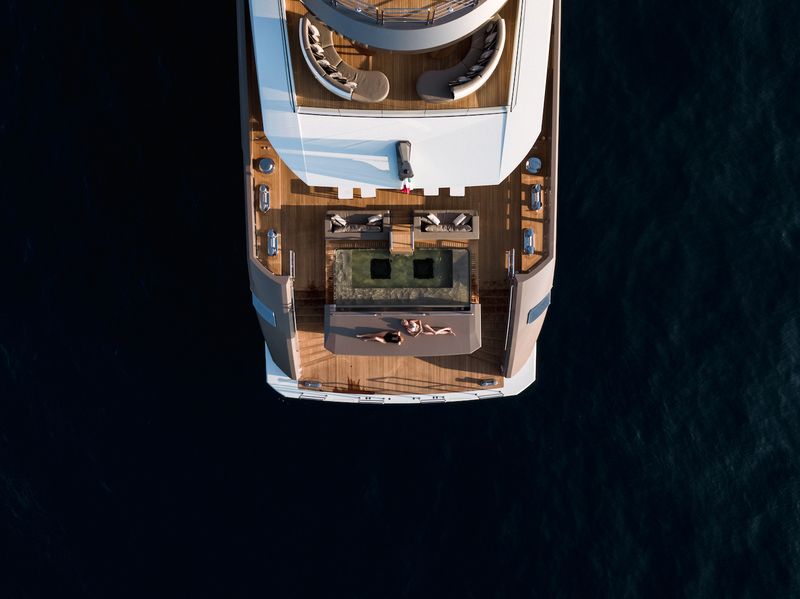 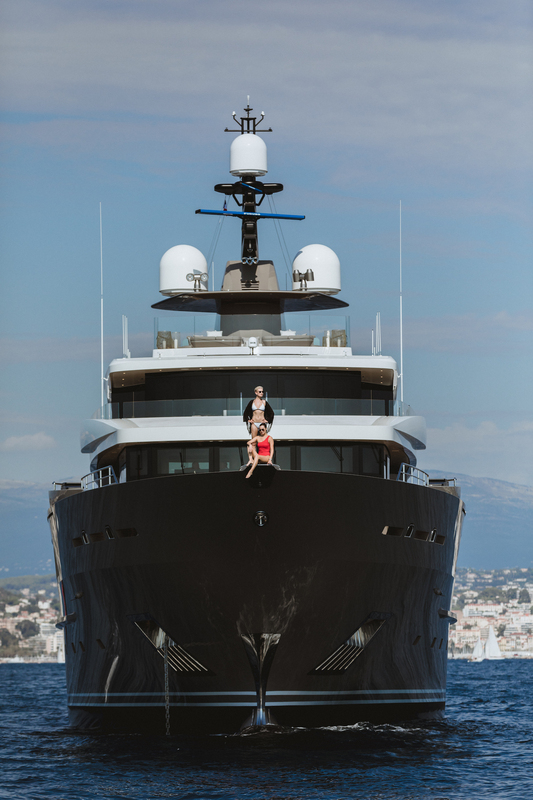 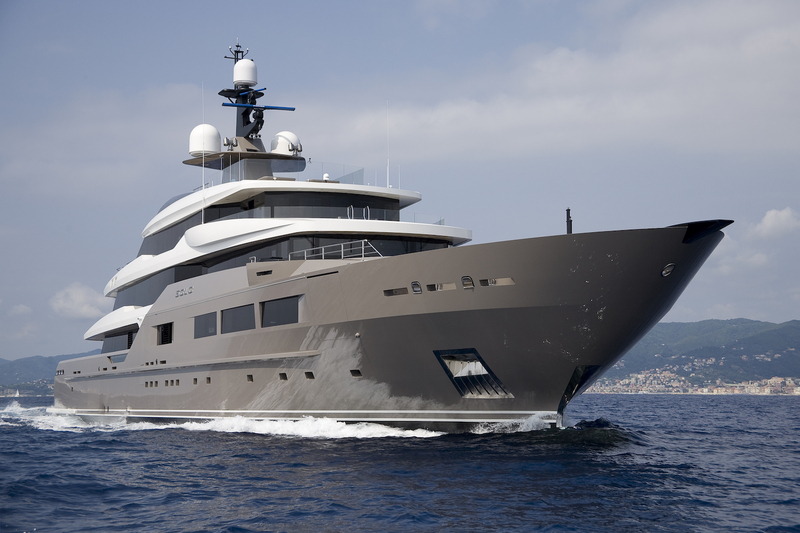 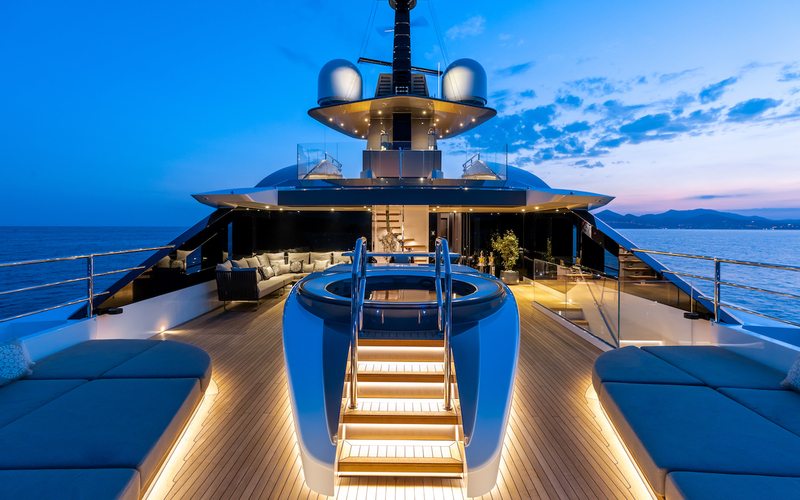 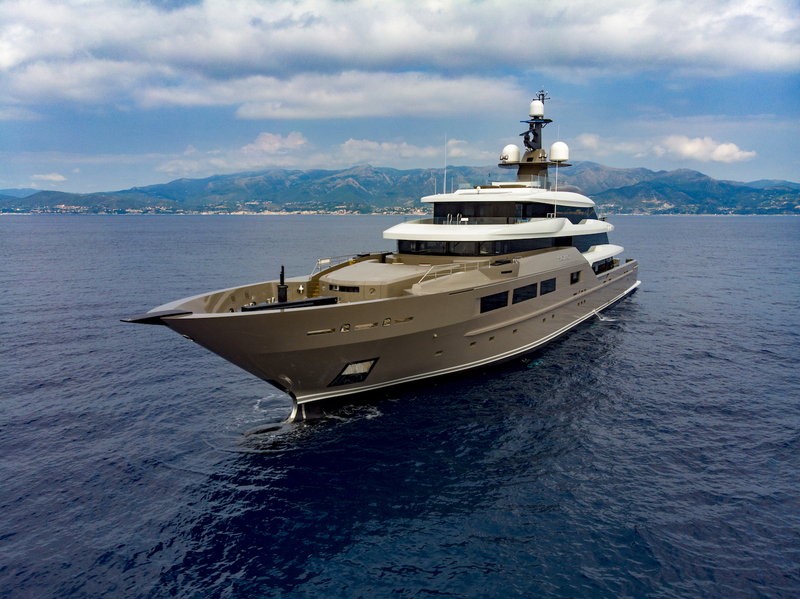 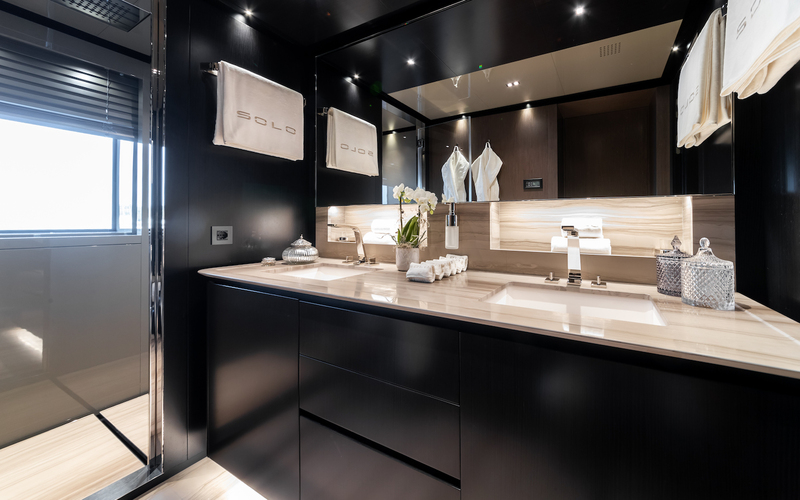 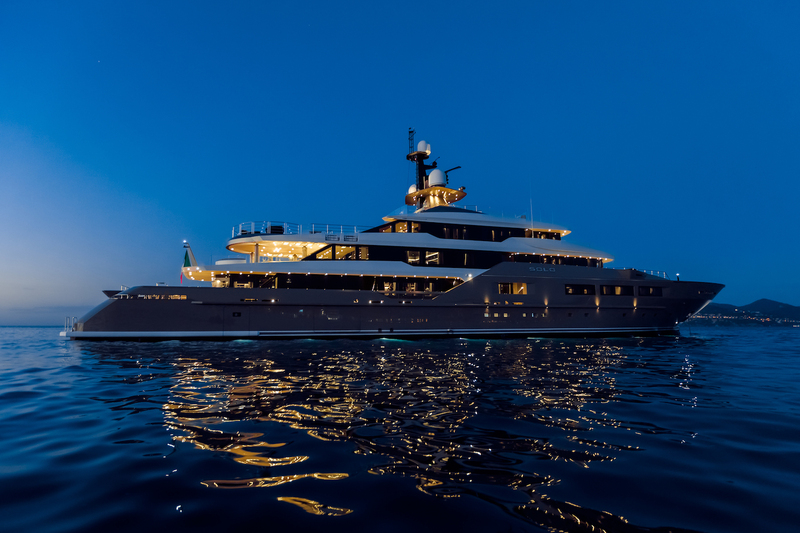 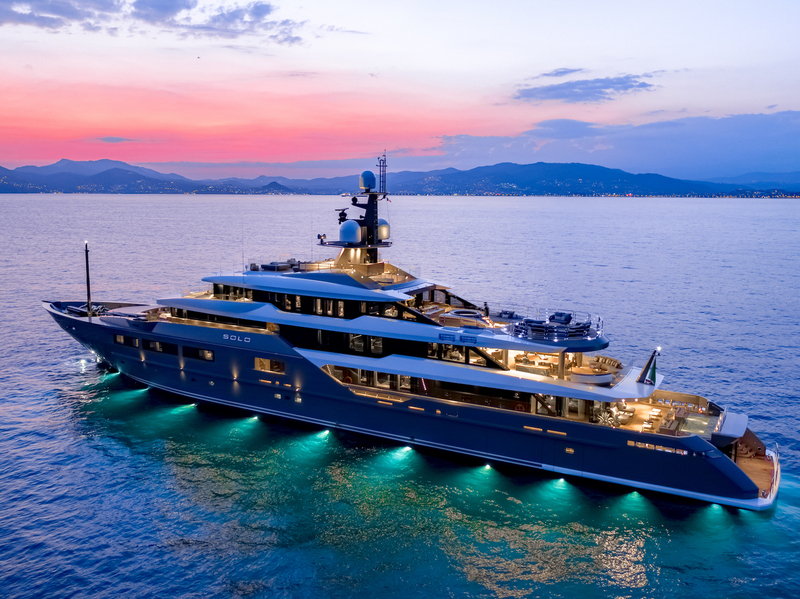 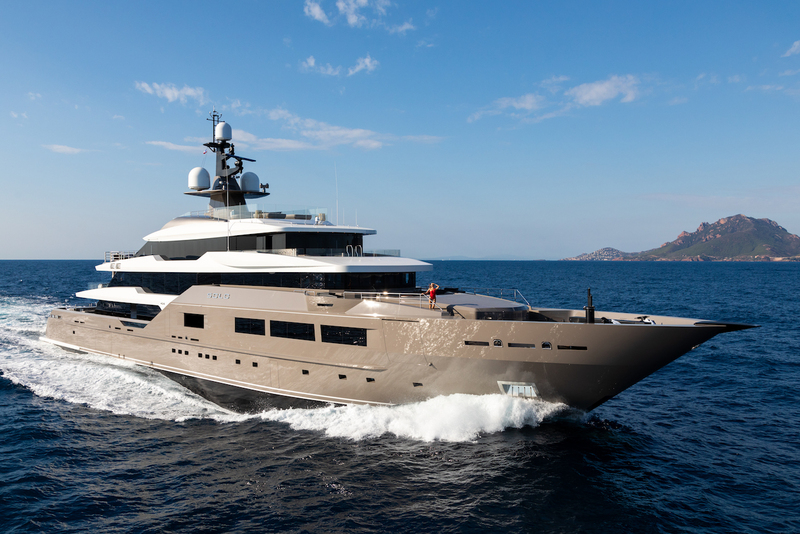 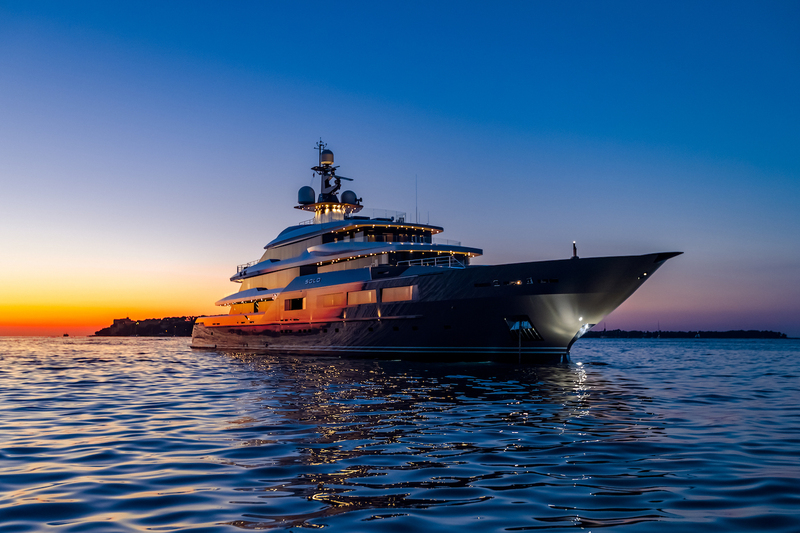 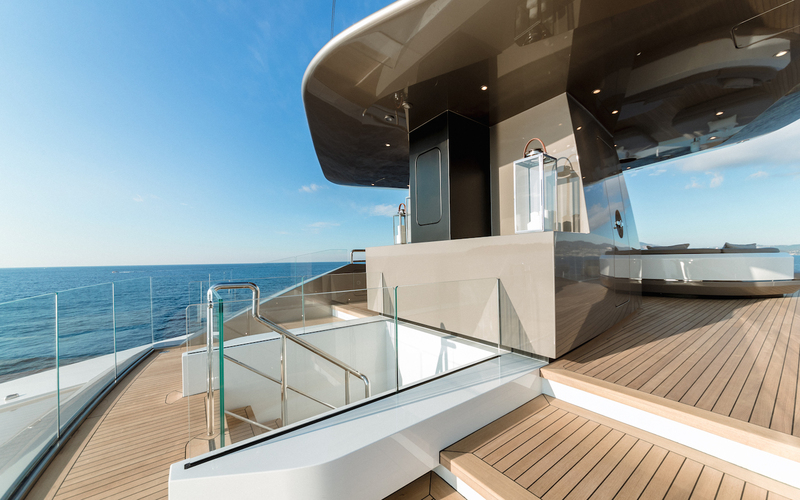 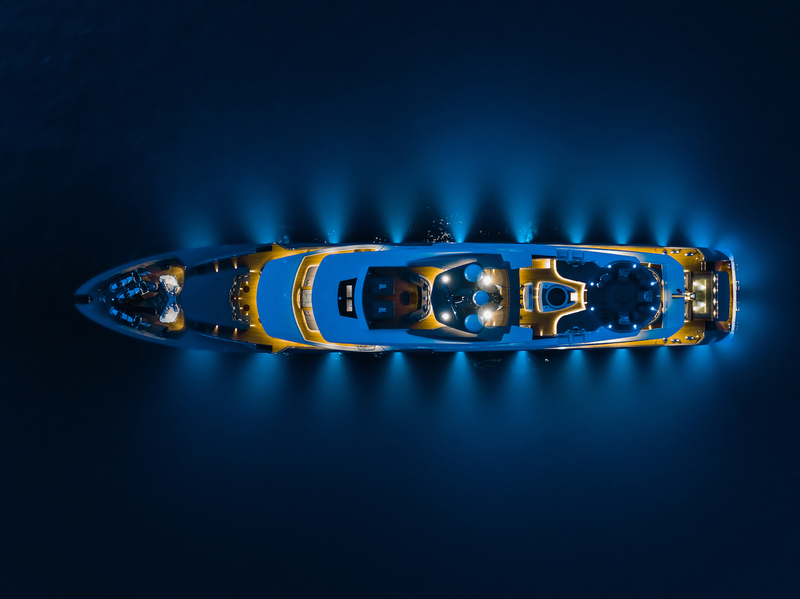 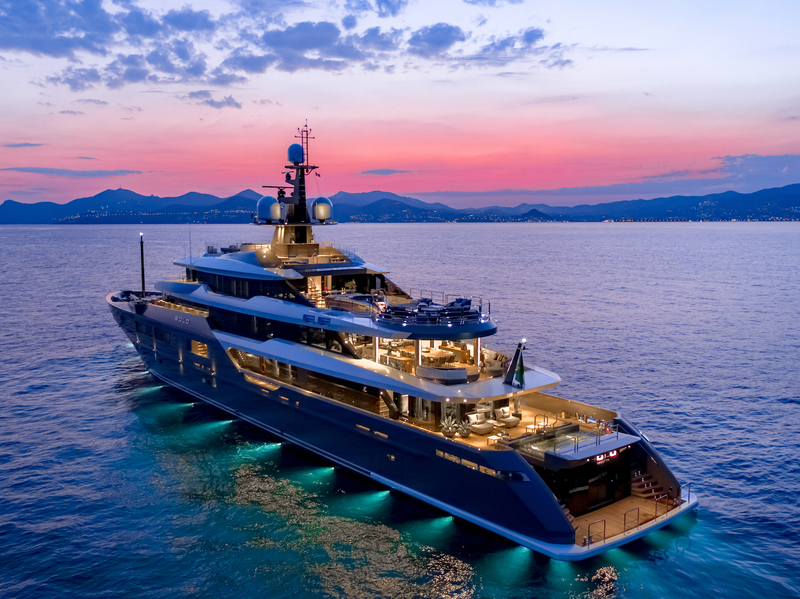 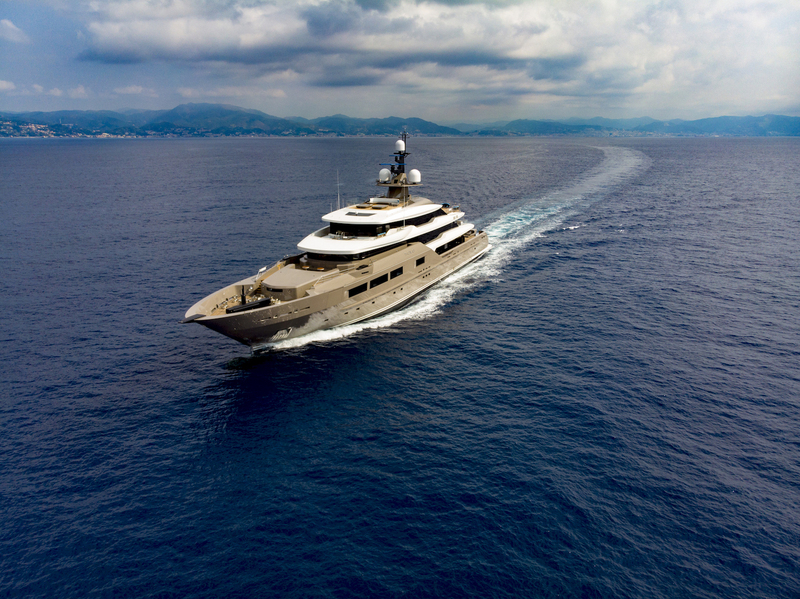 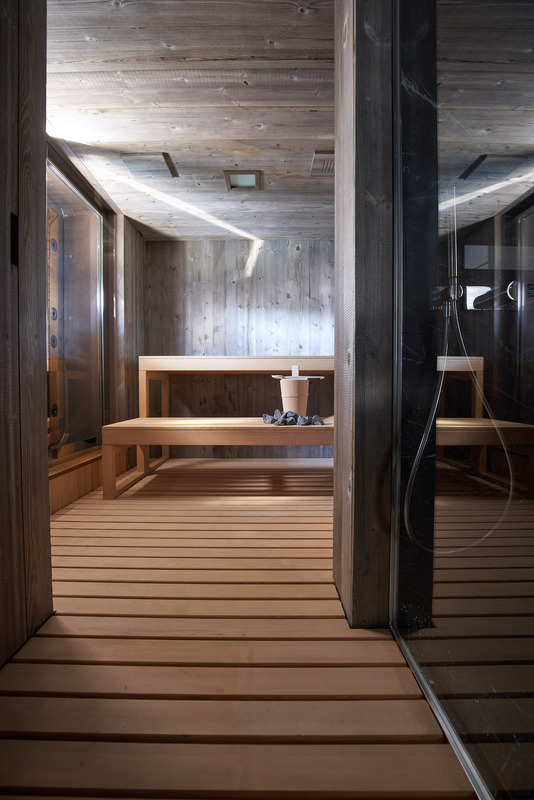 On either side of the staircases that link to the main deck aft, there is a port sauna and a starboard hammam with a cold-shower that reaches down to 5°C, and both areas have a private sea terrace. 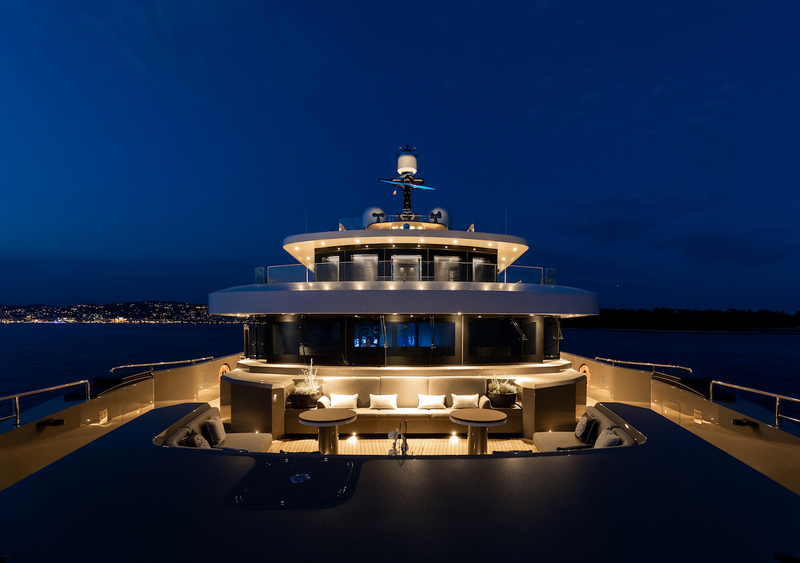 Forward is the tender garage with side-loading hatches, then the engine room and towards the bow is the galley, crew mess and crew quarters. 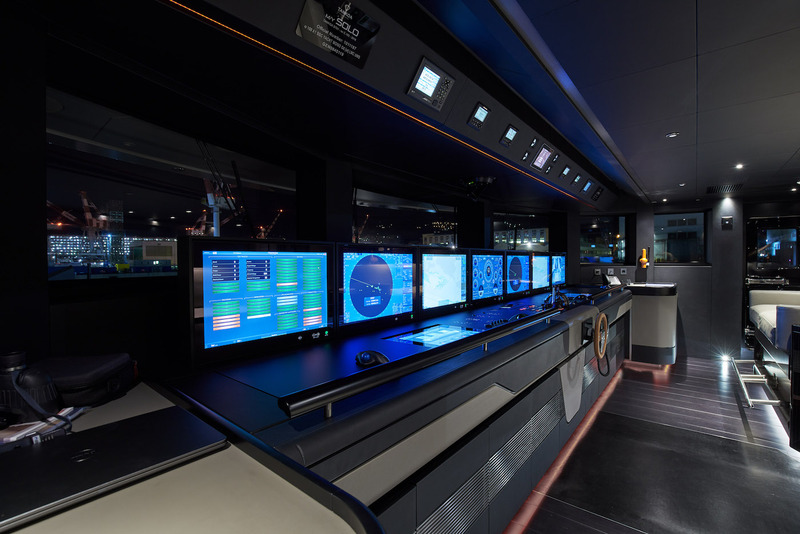 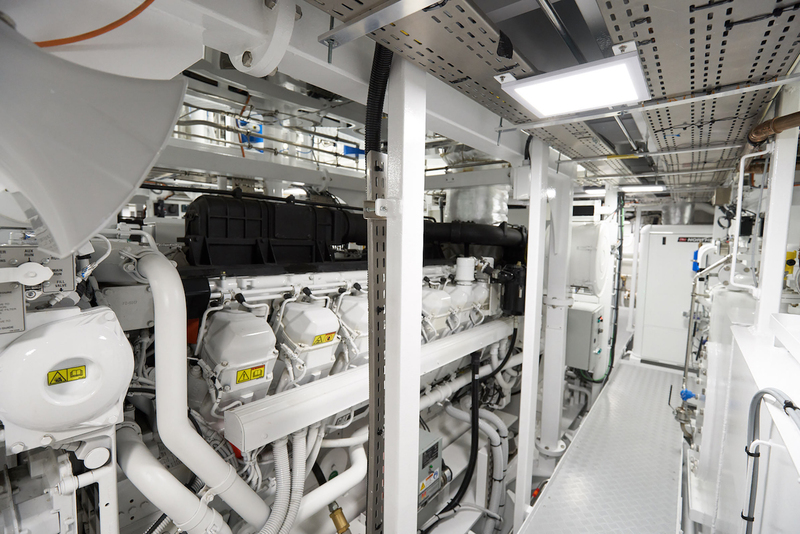 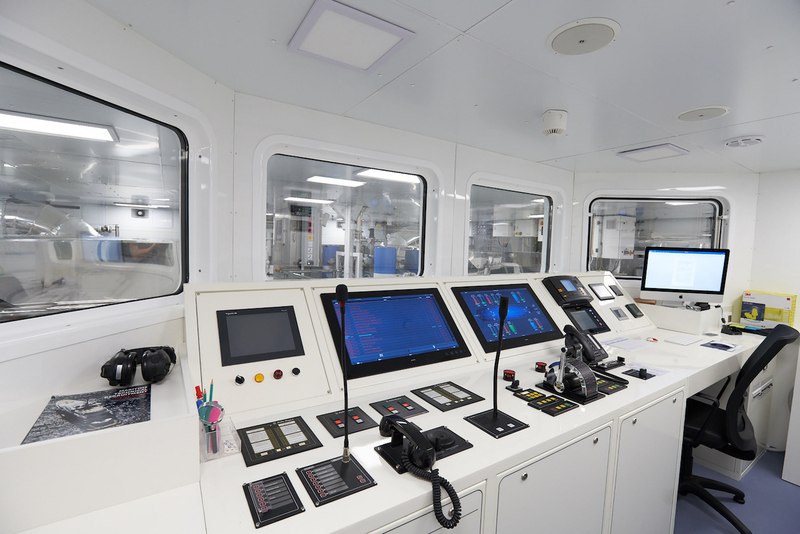 The under-lower deck hosts a number of essential amenities including a laundry room, pump room, storage (including for additional water toys), additional fridge and freezer, garbage treatment plant, technical spaces and access to the split-level engine room. 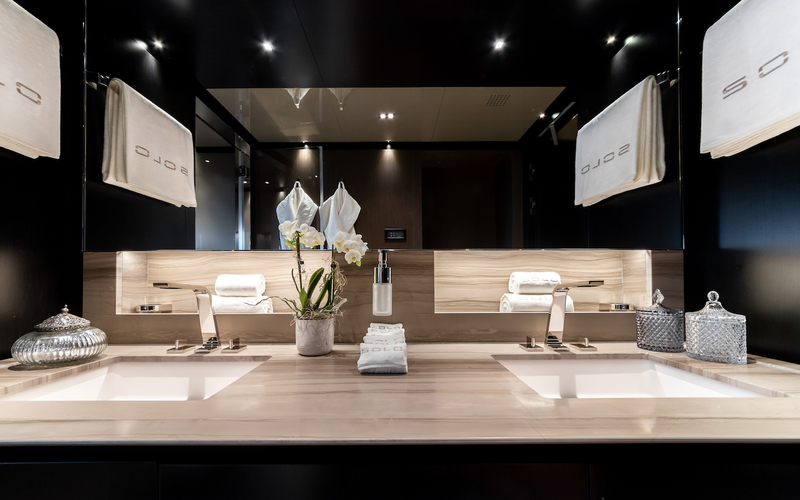 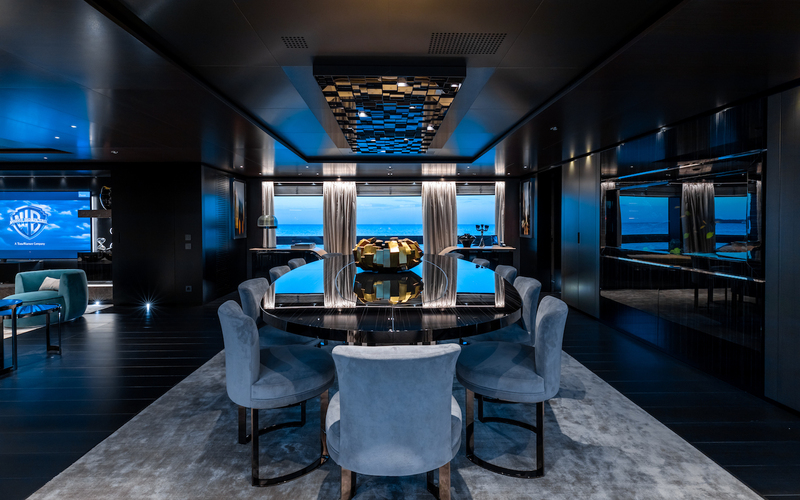 The main deck hosts the majority of the guest accommodation, including a VIP stateroom in the bow, two twin cabins convertible to doubles and two double cabins, all of which have en-suite facilities and massive windows for comfortable and naturally lit environments. 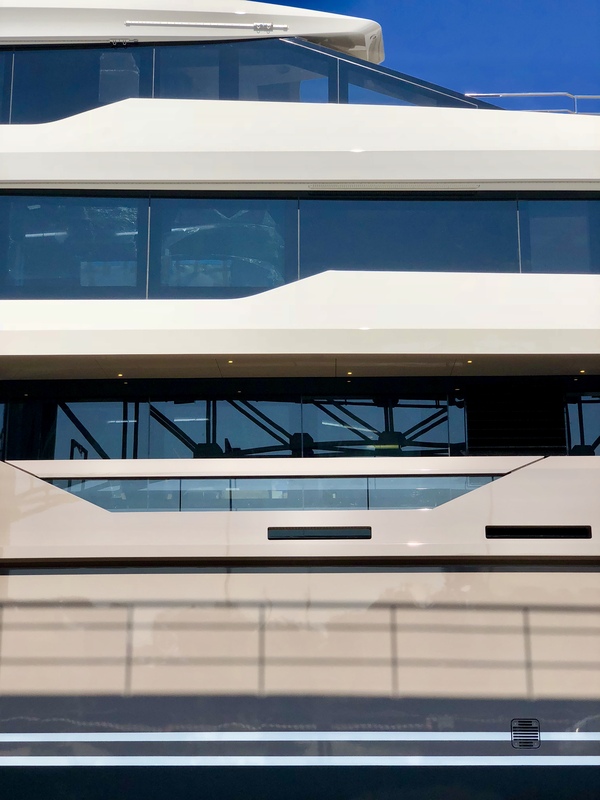 The main foyer takes up the central deck area and a lift (elevator) connects the decks. 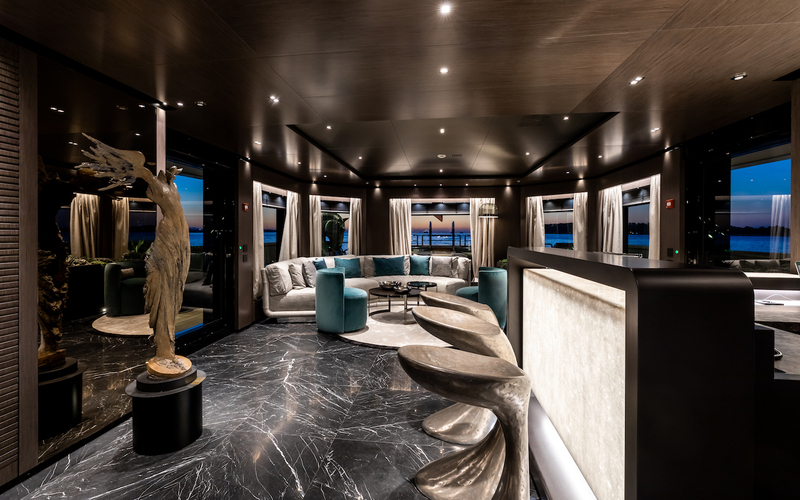 Behind the foyer, the formal dining area seats up to 14 guests in spacious surroundings where columns in light wood panelling and original artwork give the area a unique quality which separates it from the aft salon while sharing the same open-plan space. 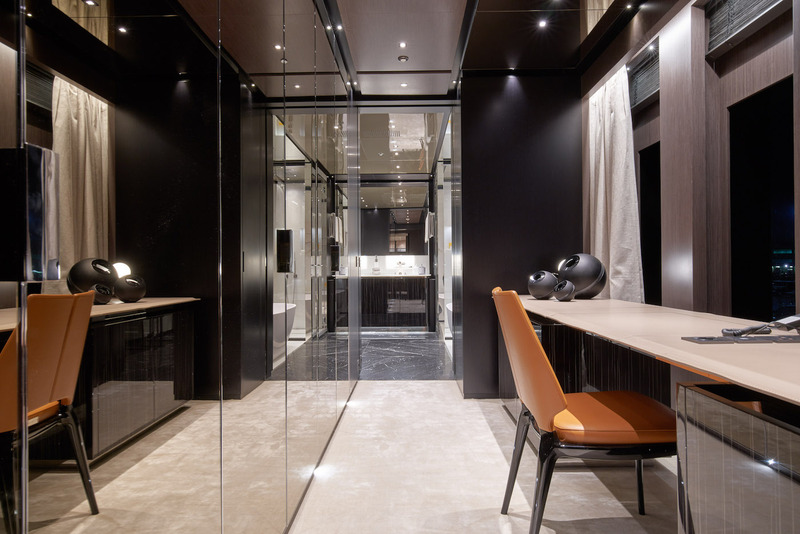 The salon itself uses neutral tones and burnished and smooth metals to play with the natural light coming in through the expansive windows running the length of the room. 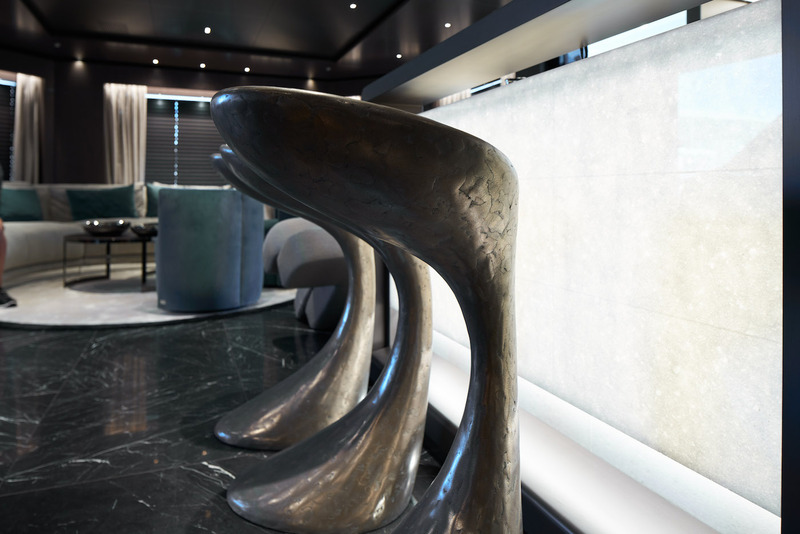 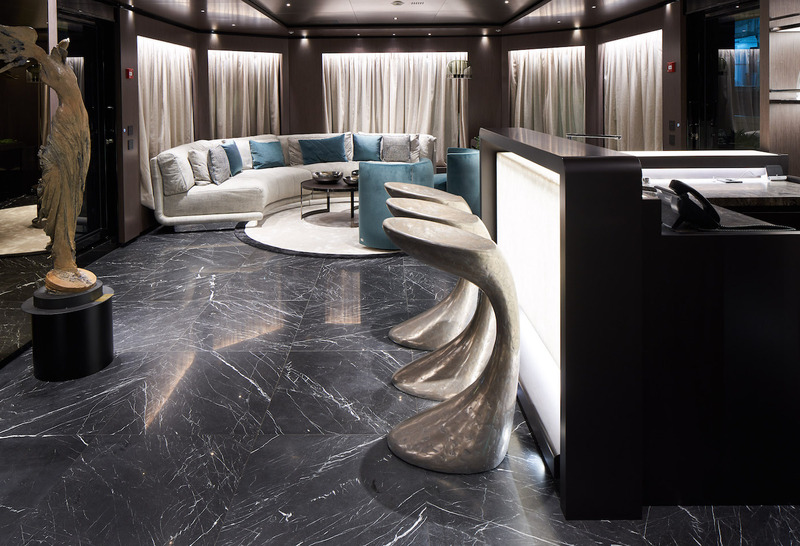 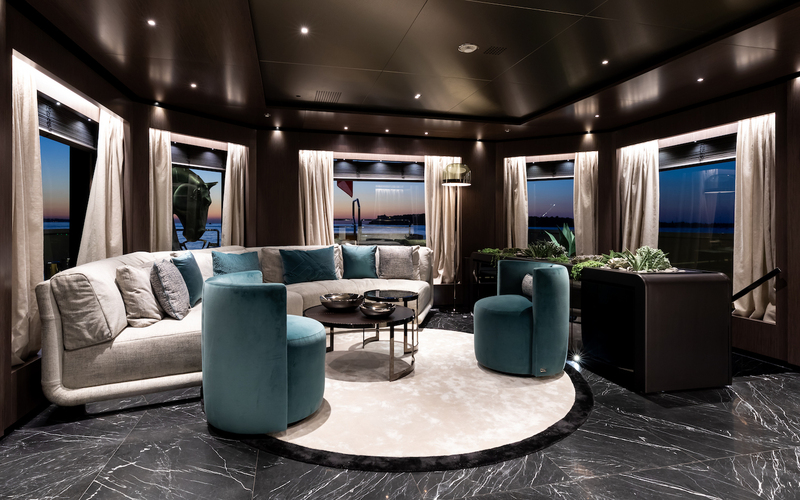 The sofas and other seating in the main salon and throughout M/Y SOLO is of the highest quality and comes from Fendi Casa. 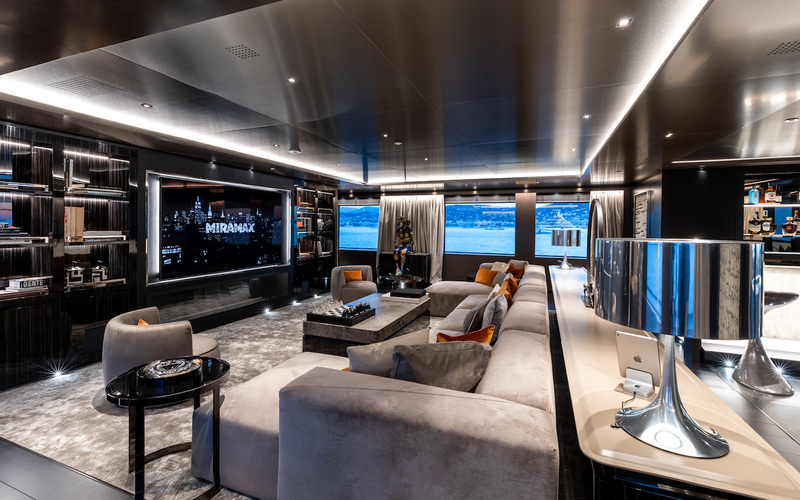 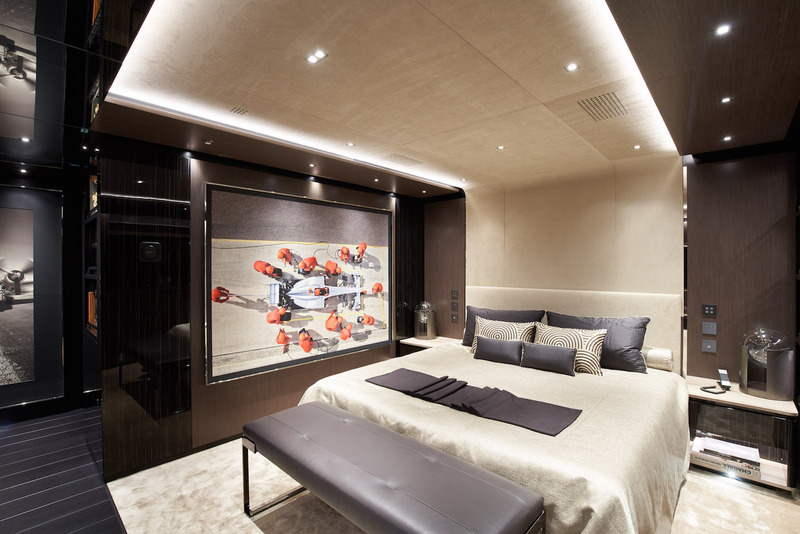 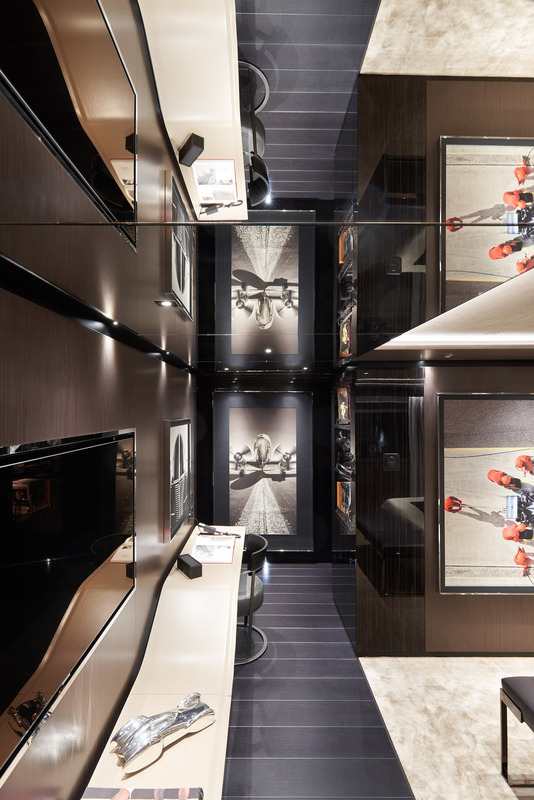 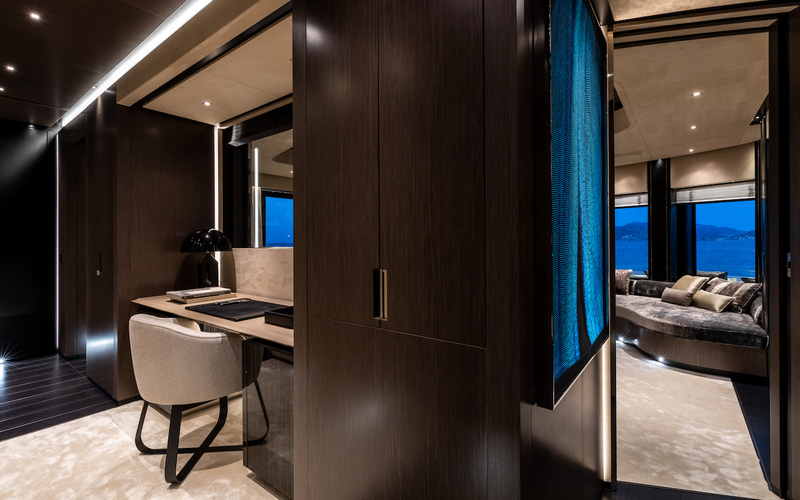 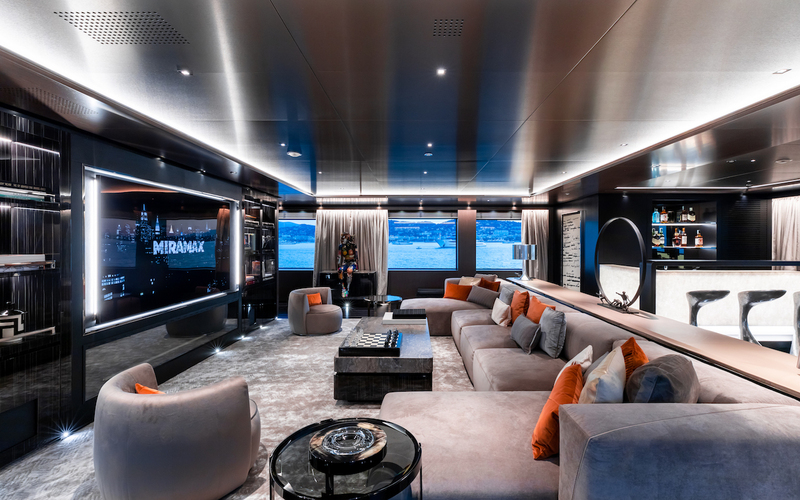 On the upper deck, the full-beam Master suite takes up the front section of the layout and contains a private studio/media room, walk-in wardrobe and massive en-suite bathroom. 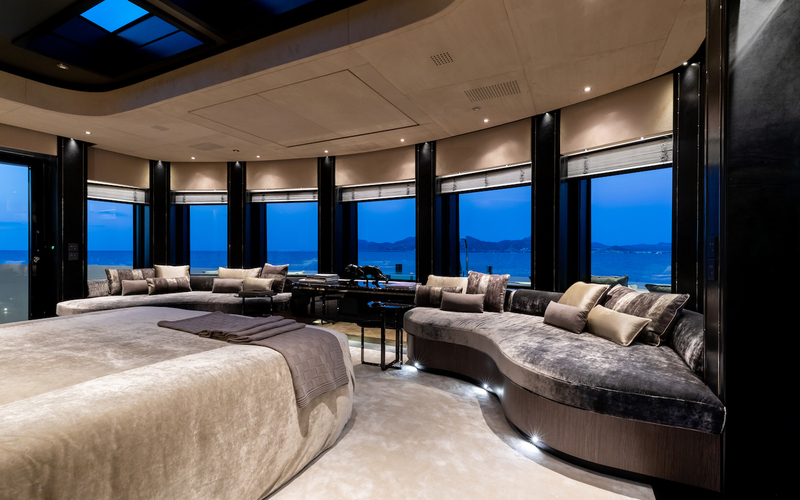 The island bed receives 180° views from forwar floor-to-ceiling windows. 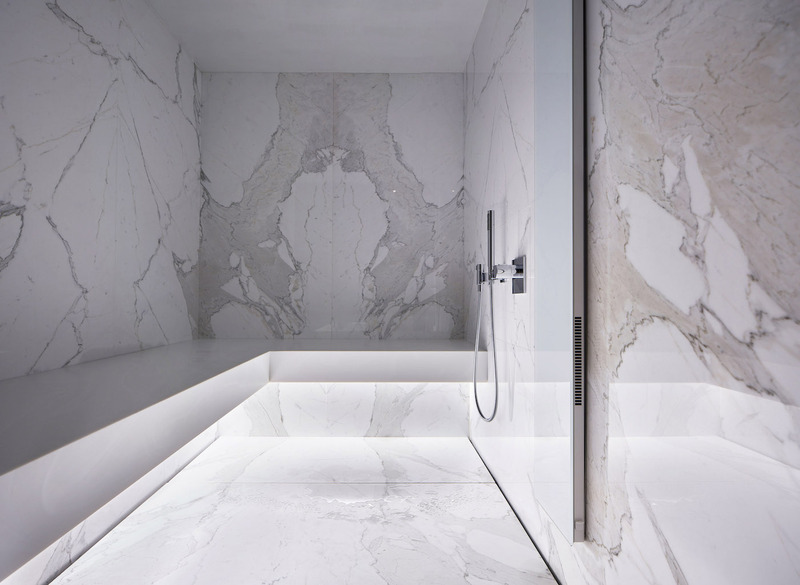 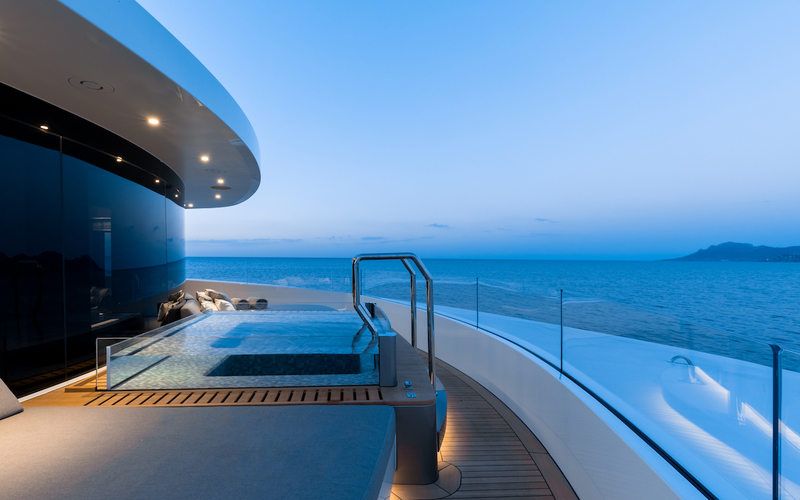 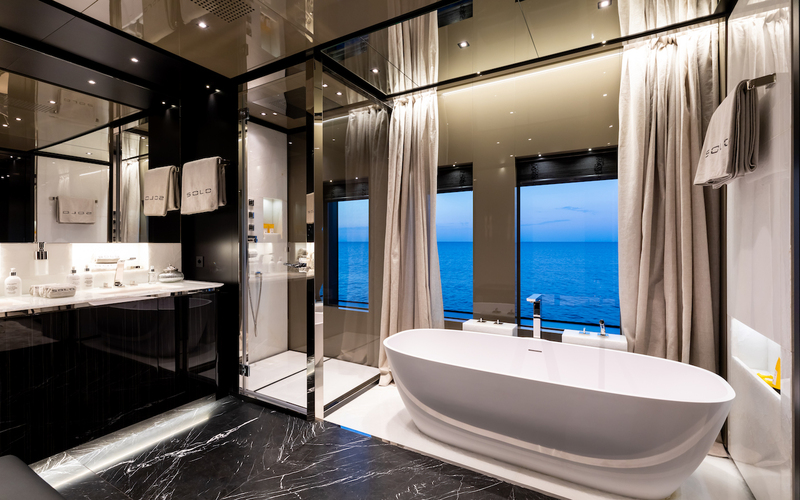 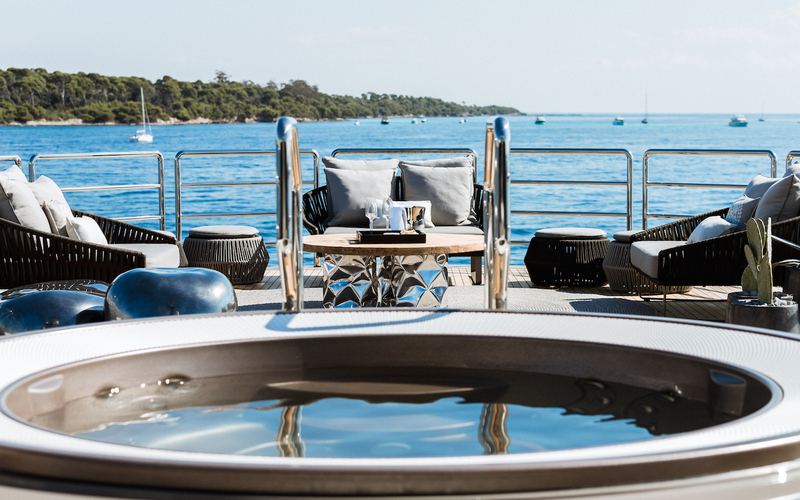 The bow is a private outdoor space for the occupants of the Master suite to use and contains seating, sun pads and a Bisazza mosaic tiled glass-walled Jacuzzi. 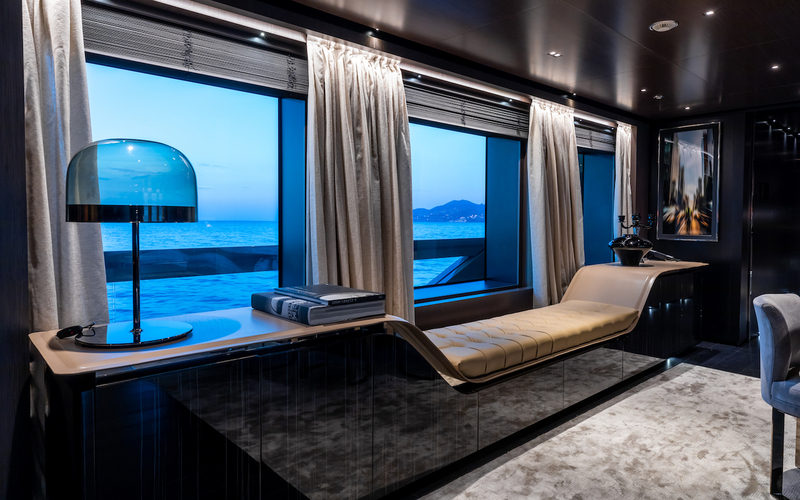 Behind the Master suite the expansive sky lounge is designed for entertaining large numbers of guests and there are two L-shaped sofas plus armchairs and tables for resting drinks from the forward bar. 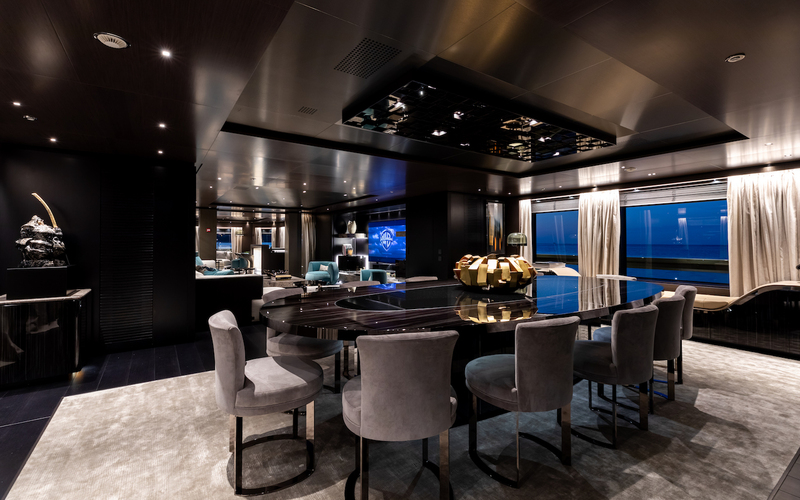 There are two games tables to add to the entertainment options. 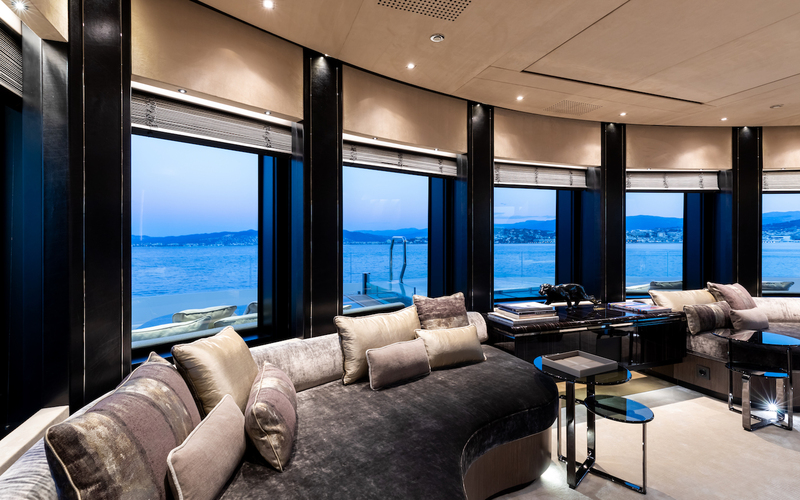 On the bridge deck the forward area contains the helm and aft there is an observation lounge with almost full-height windows furnished with a 90” 4K QLED TV screen, baby grand piano, bar and ethanol encapsulated fireplace for relaxation after a visit to the hair salon and massage room also located on this deck. 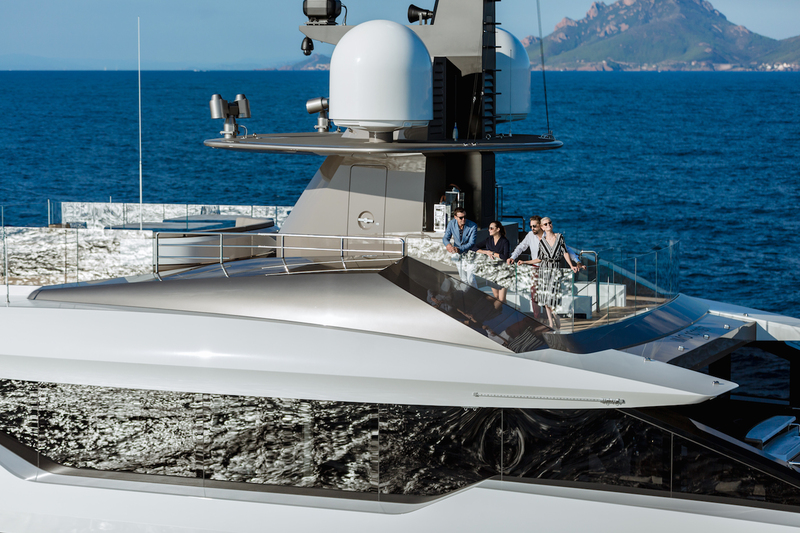 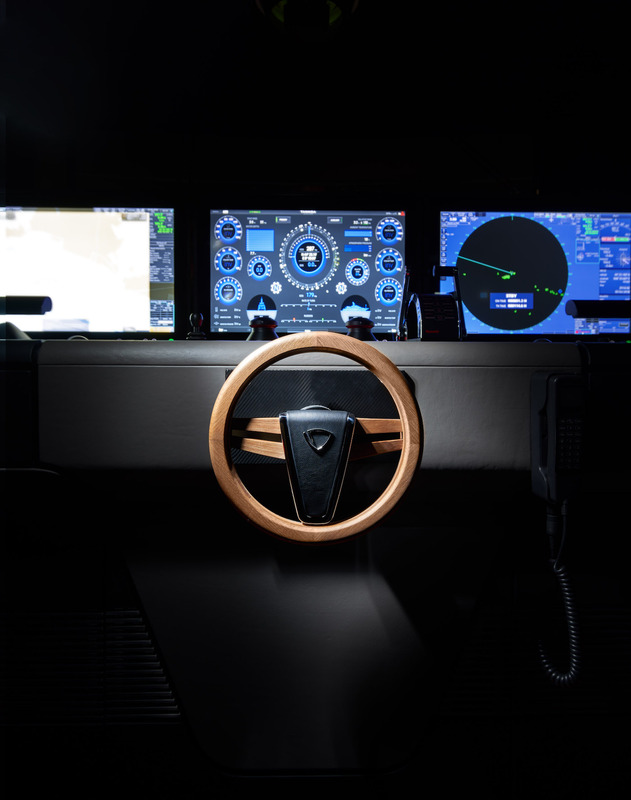 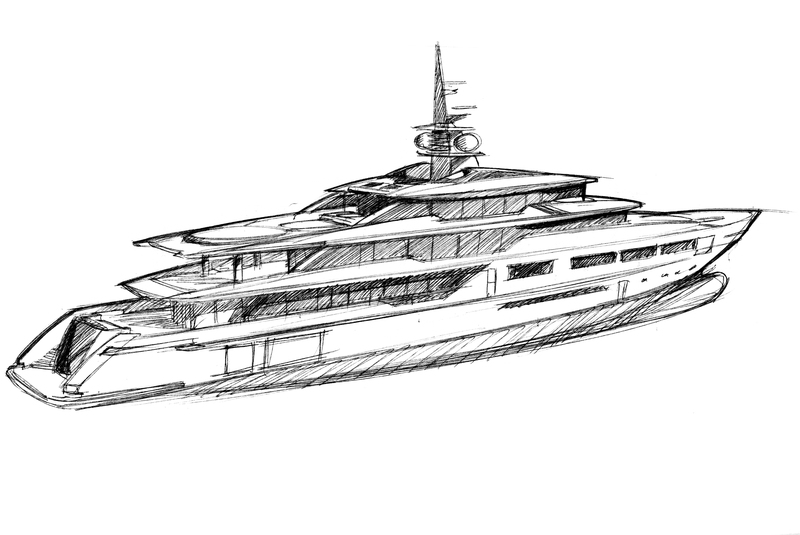 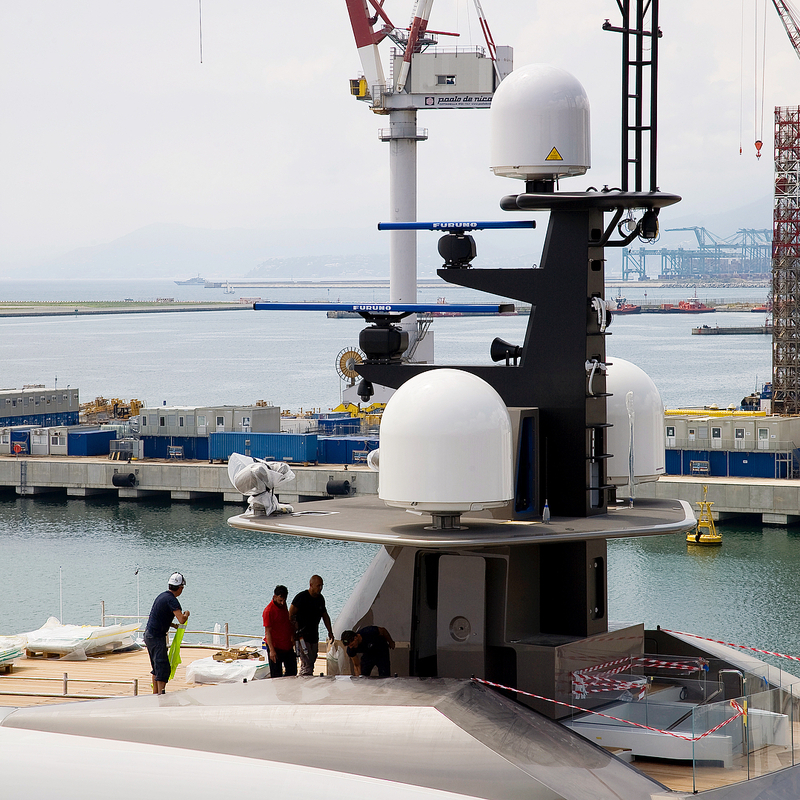 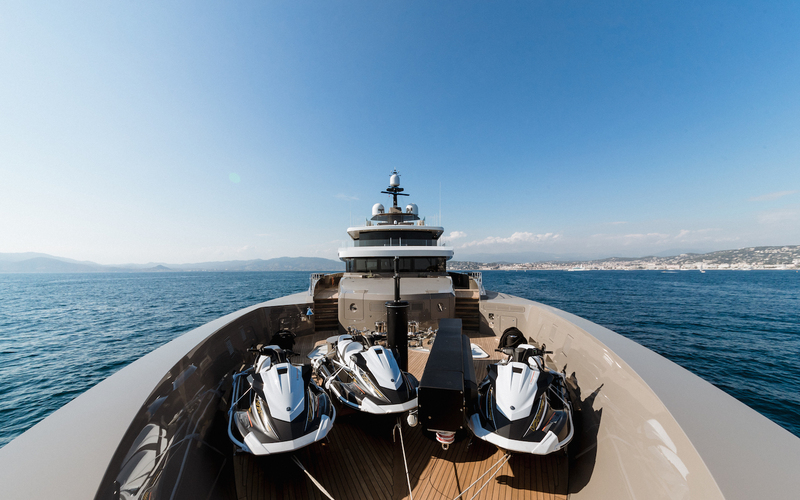 A pair of 1.825 kW engines at 1.600 rpm produce a top speed of 17.5 knots and a cruising speed of 15 knots. 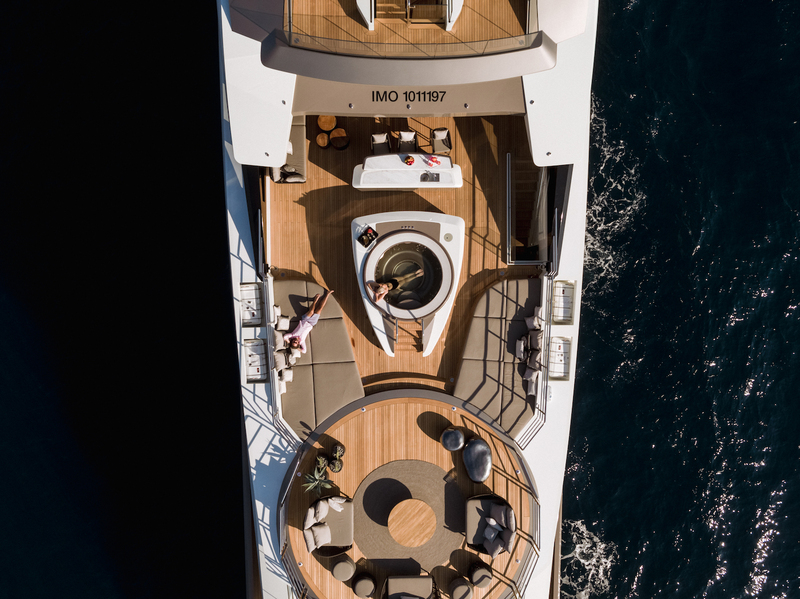 At 16 knots she has a range of 3,000 nautical miles while at an economical 12.5 knots she can reach 6,000 nautical miles. 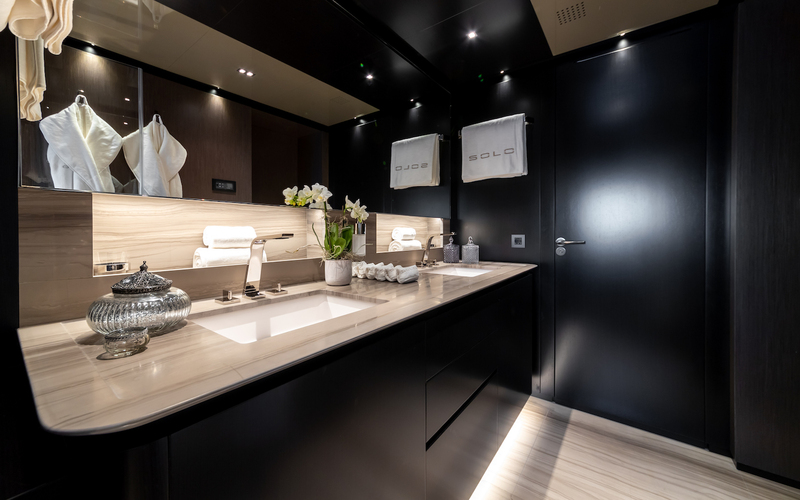 The accommodation is designed to sleep a maximum of 12 guests over 6 cabins: 1 Master suite, 1 VIP stateroom, 2 double cabins and 2 twin cabins convertible to doubles, all with en-suite facilities. 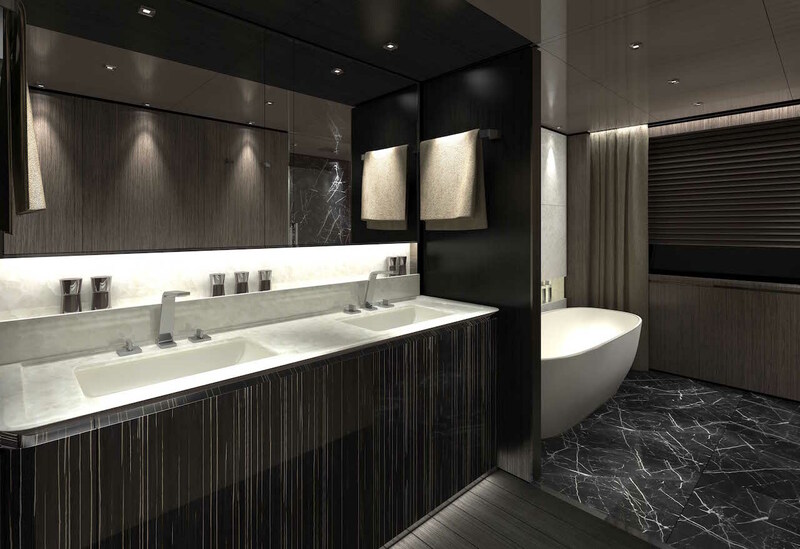 The Master study and hair salon/massage room can be converted into additional cabins as both have en-suite bathrooms. 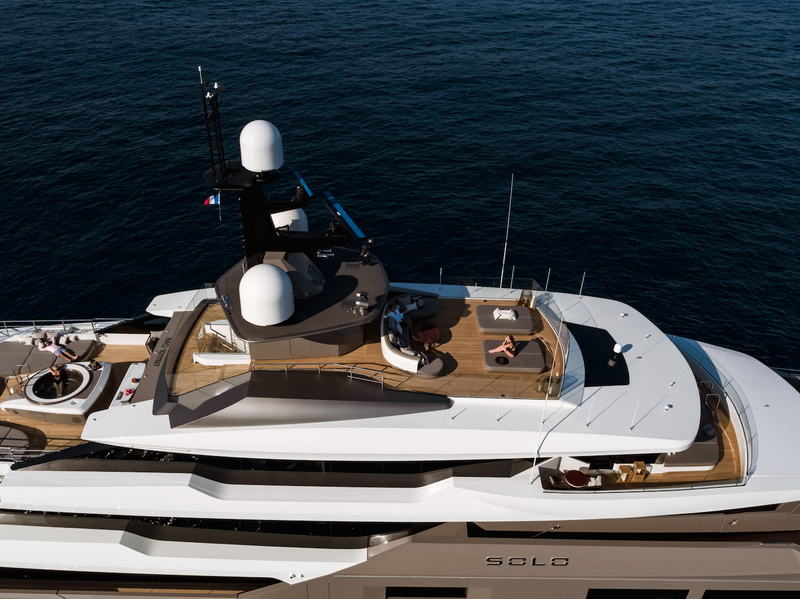 We do have available further amenity, owner and price information for the 72m (236'3") yacht SOLO, so please enquire for more information.